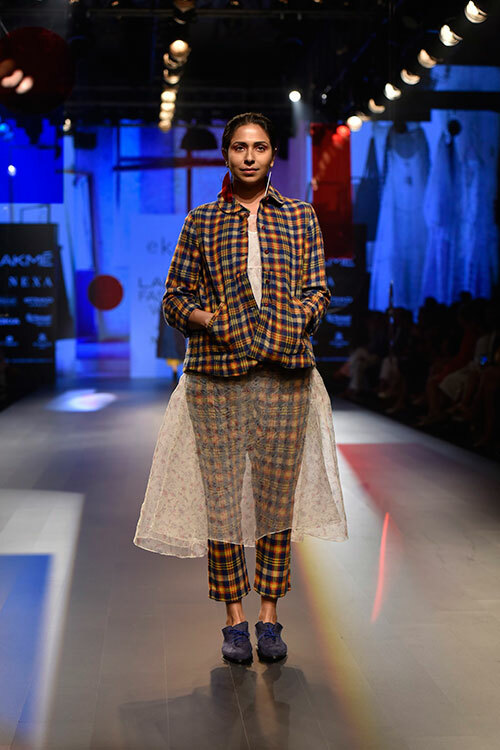 Pallavi Shantam’s Buna may have been founded just last year, but the label is already making its presence felt in the fashion industry with its dedication to a strong design philosophy. 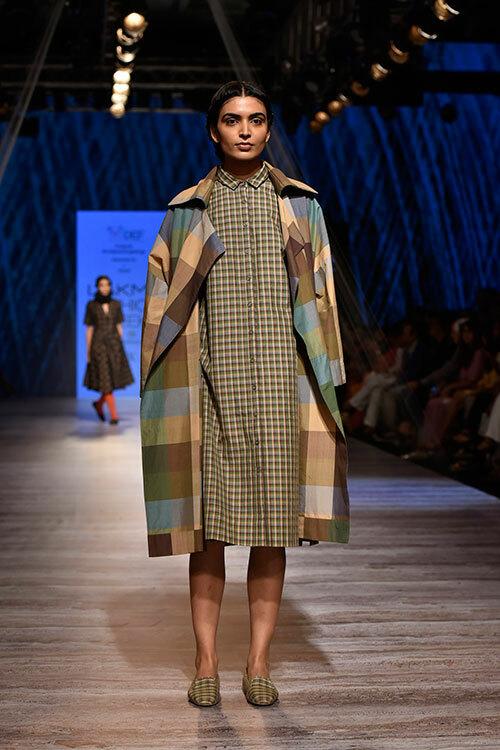 Showcasing a collection titled ‘Time Whisperer’ yesterday, the brand borrowed from the Japanese concept of Wabi-Sabi — an art that celebrates flaws — in an attempt to highlight the imperfections of fabric by adding patchwork to create new textures. 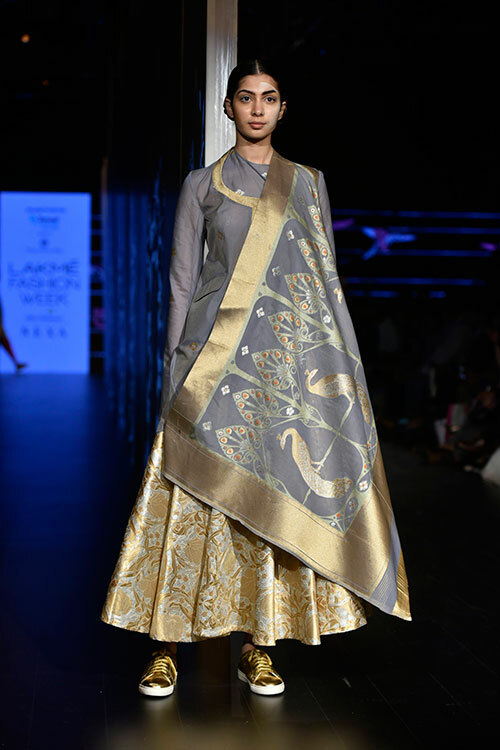 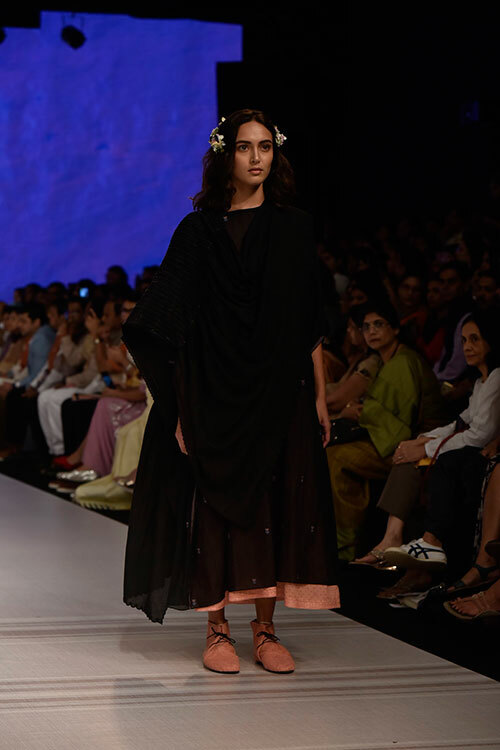 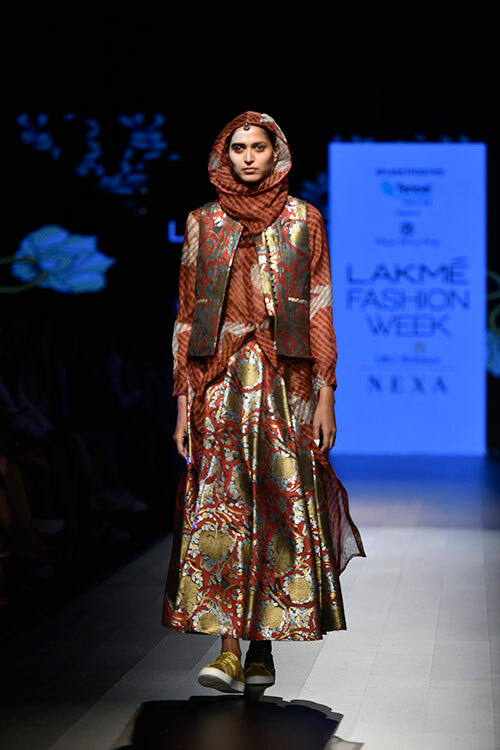 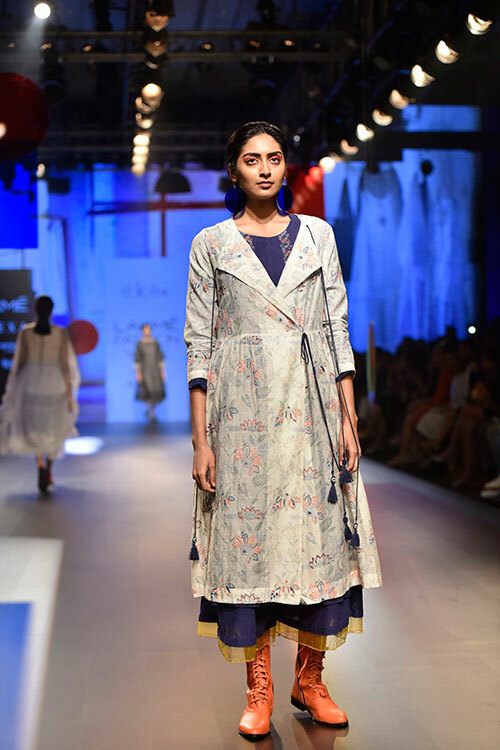 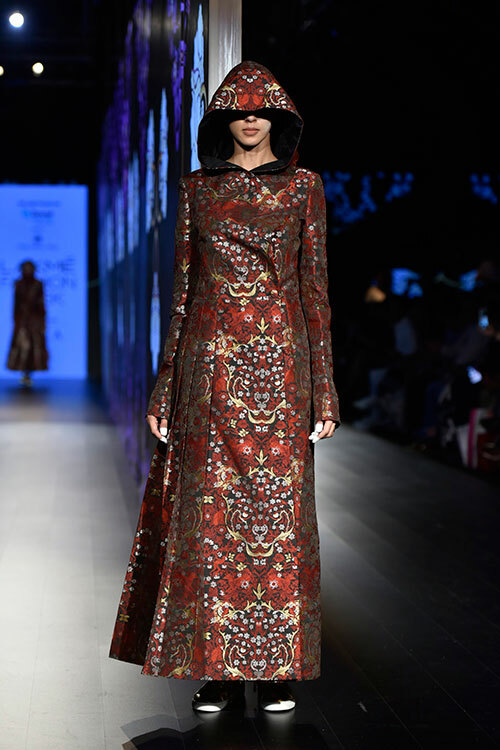 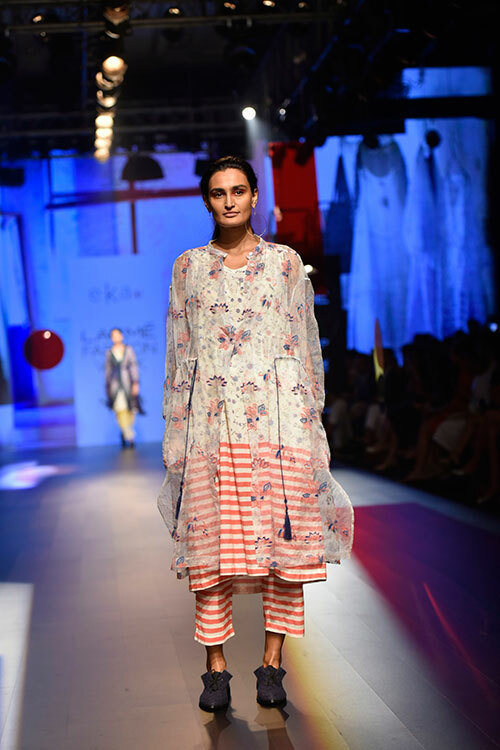 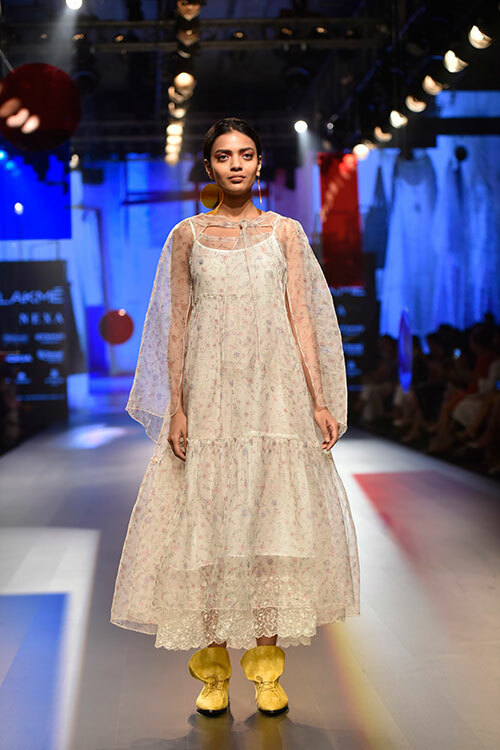 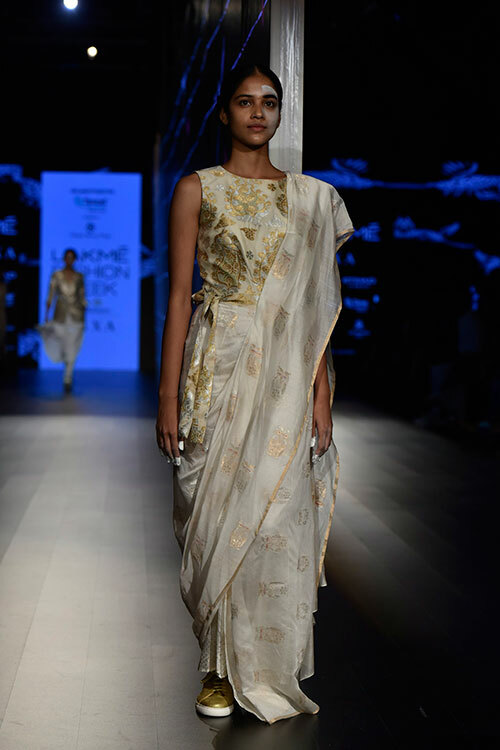 Delicate flowers, buds, leaves and berries made an appearance on sheer Khadi silks and muslin and billowing silhouettes seemed to be the norm as midis and fluid maxis moved in perfect harmony with the music. 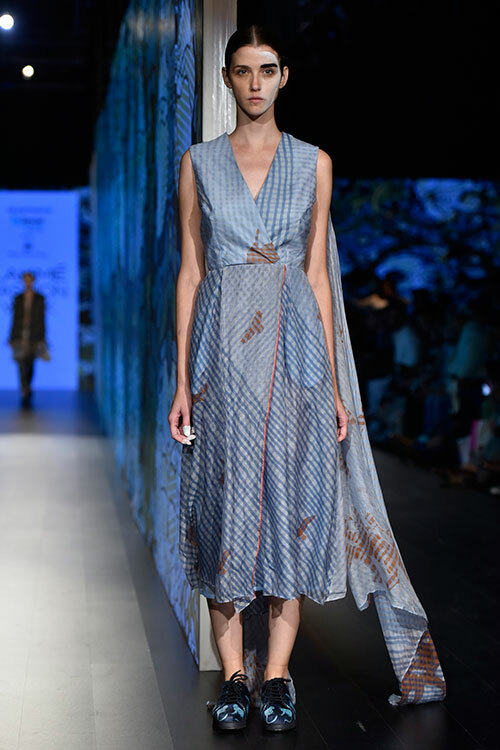 Working with Ikat, Indigene wove a story around garments inspired by the different regions of the globe. 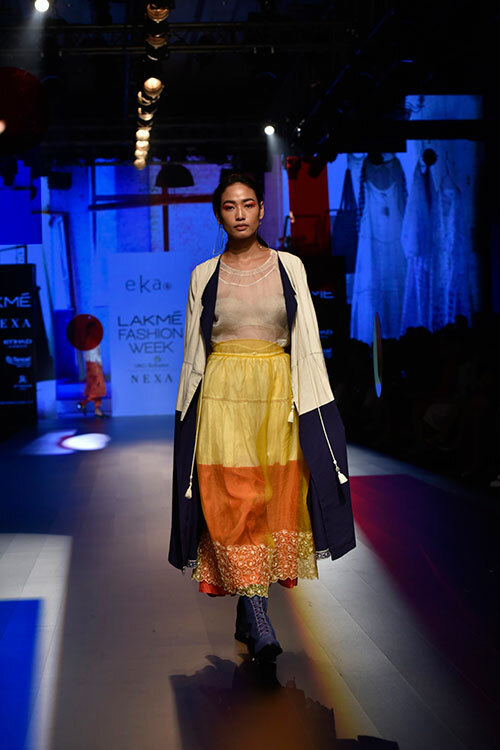 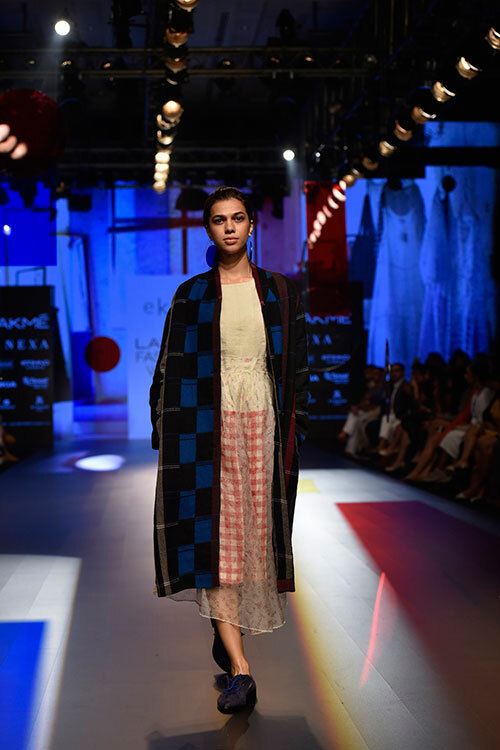 Firmly entrenched in the concept of zero wastage, the brand made use of textile leftovers and turned them into patchwork scarves and buttons for the garments. 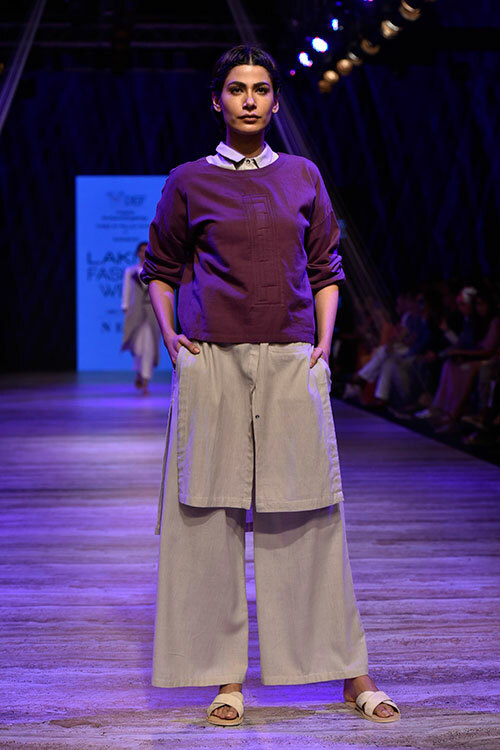 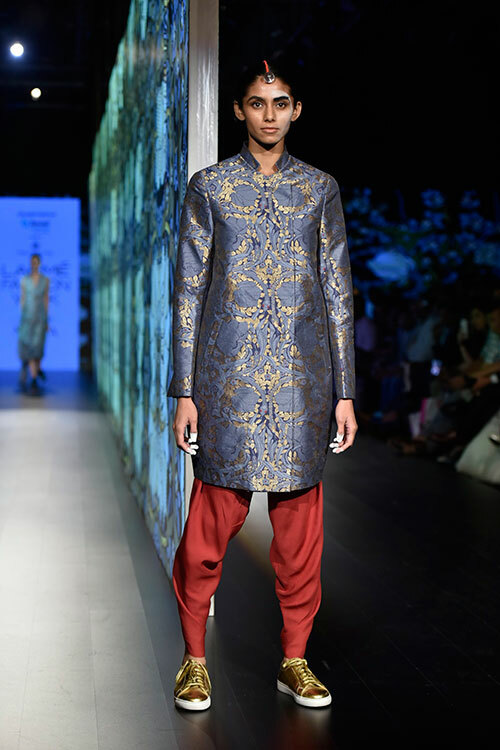 Exotic chappans, kurtas and khalats that are favoured by the men and women from Central Asia were given a novel twist and paired with slim fit pants. 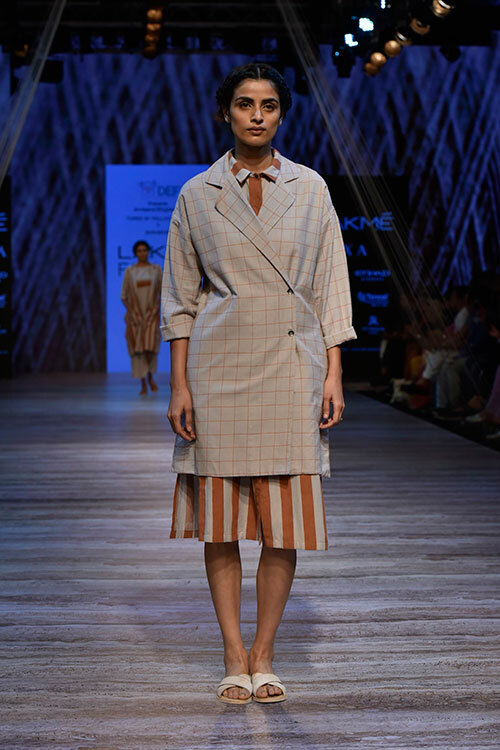 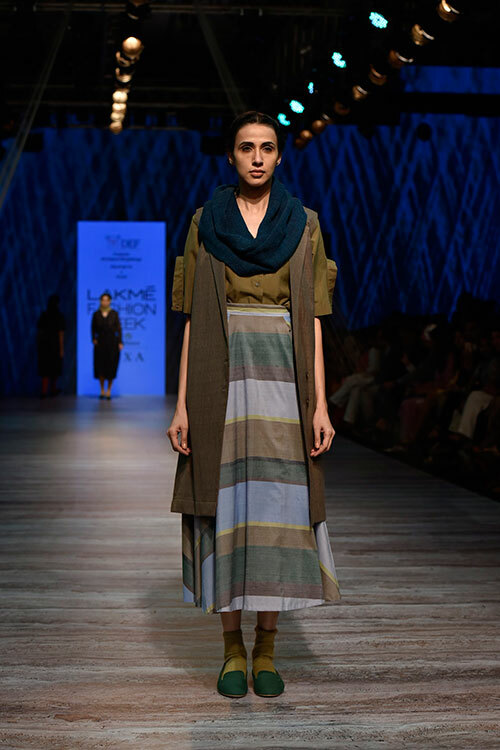 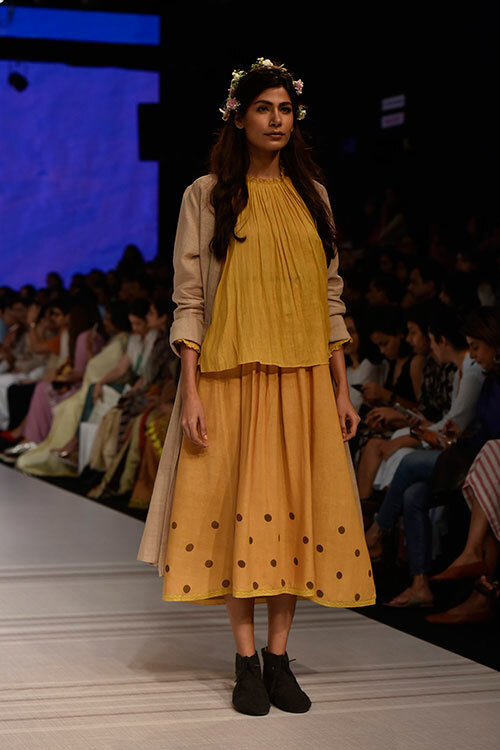 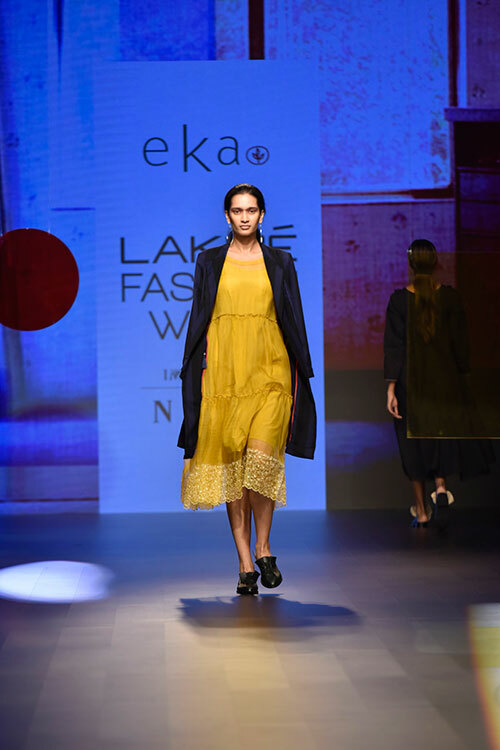 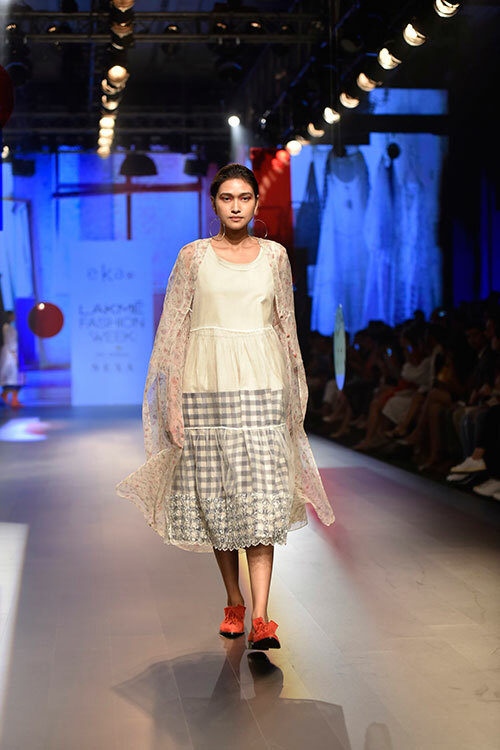 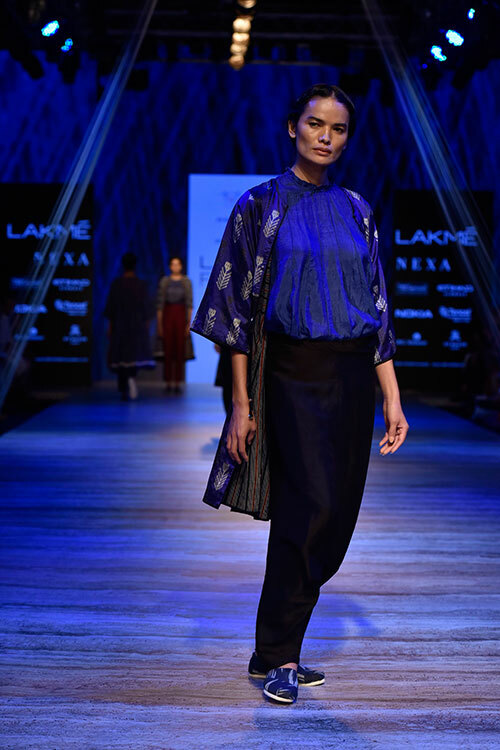 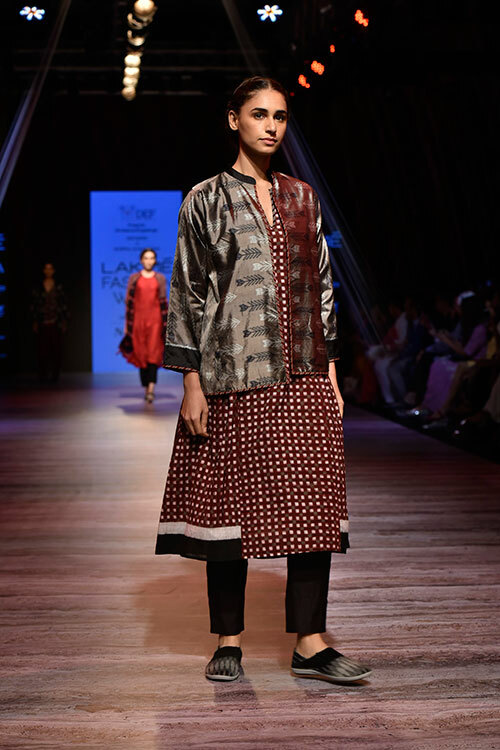 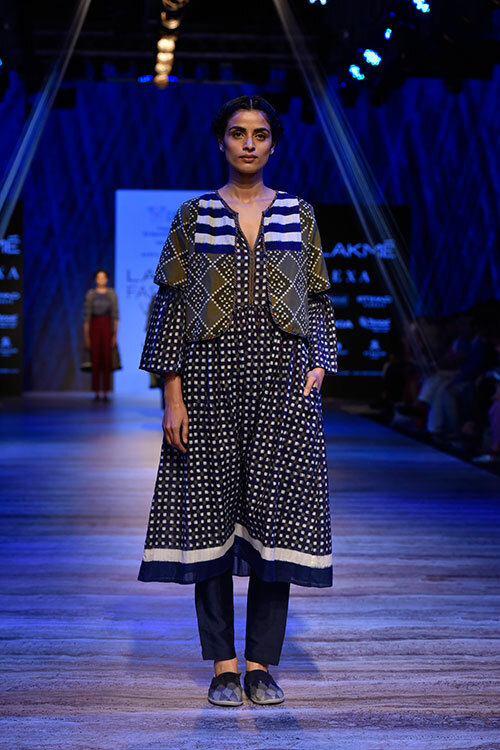 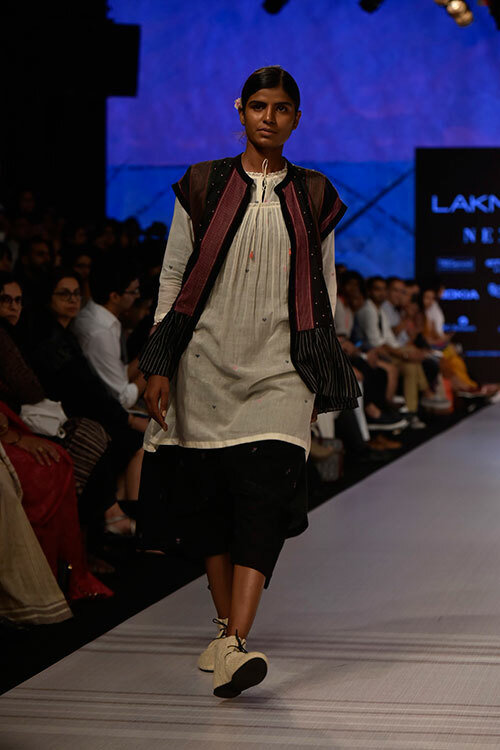 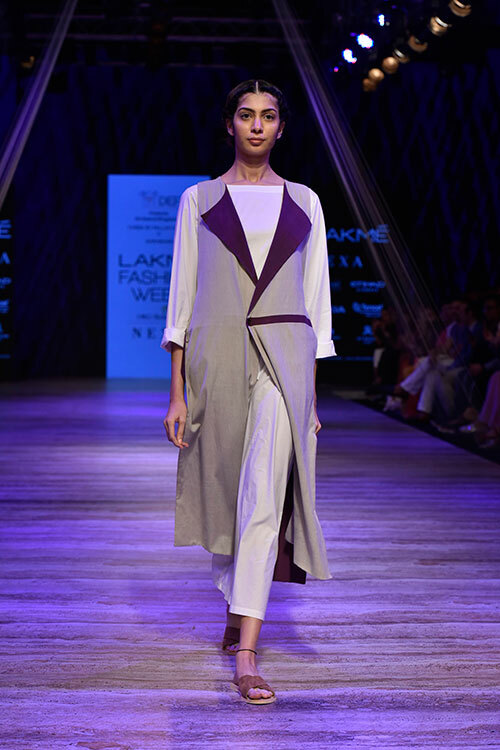 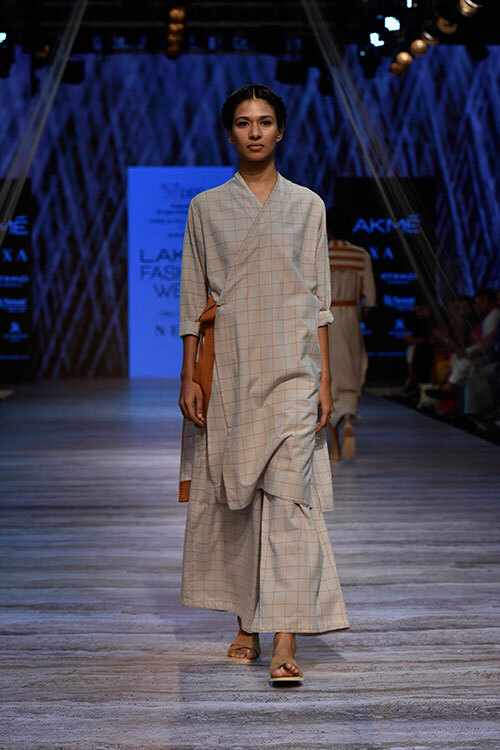 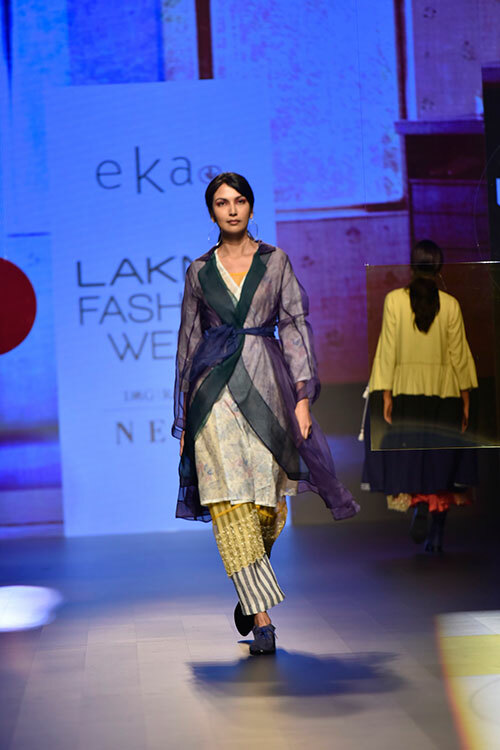 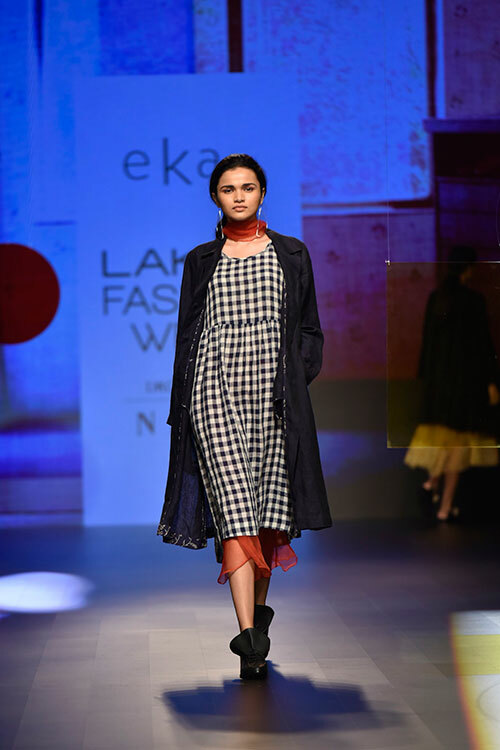 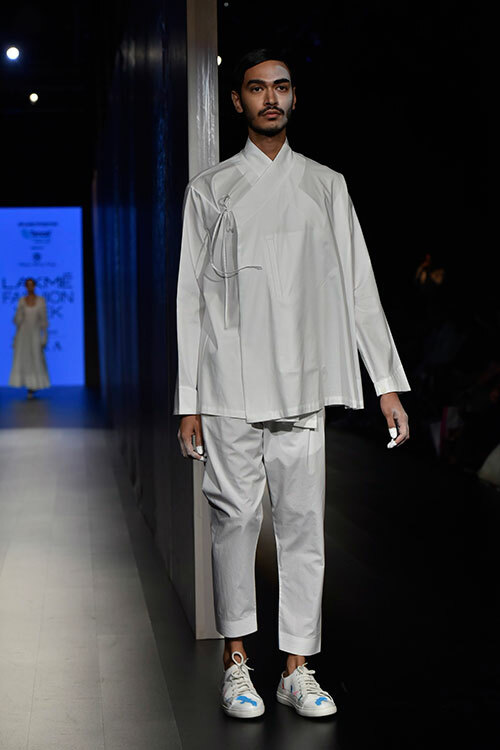 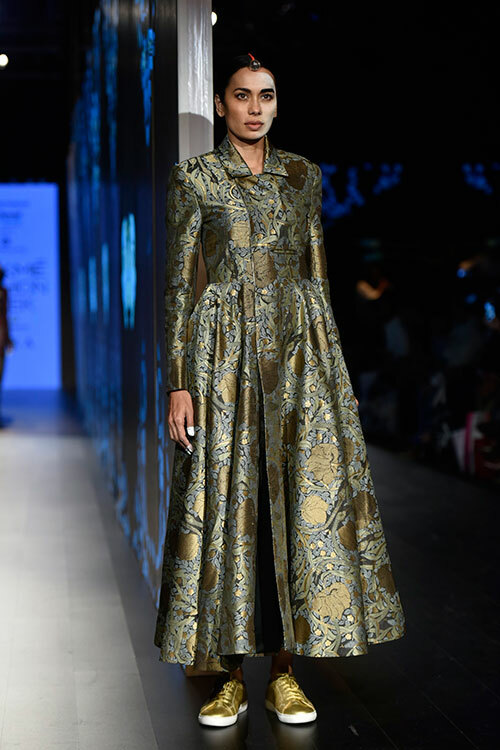 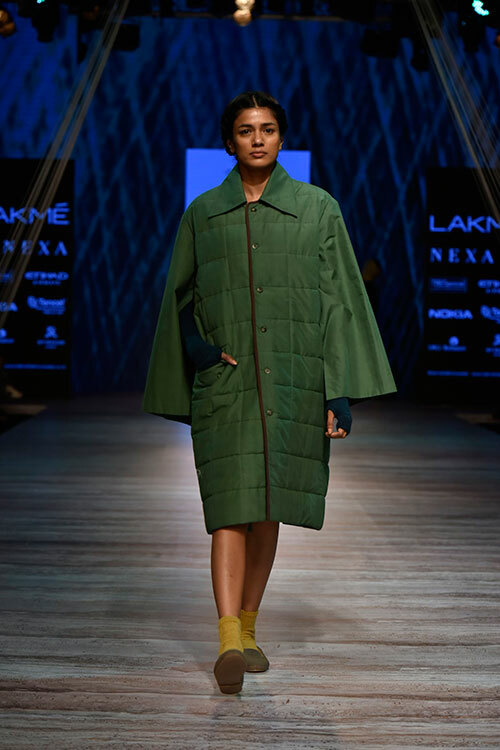 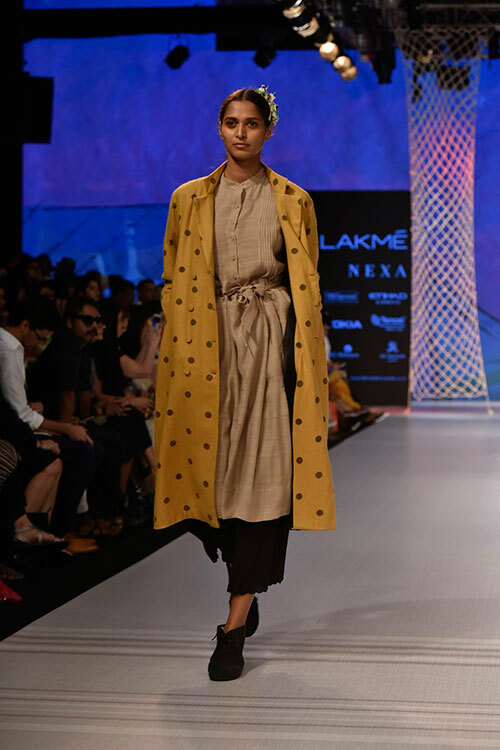 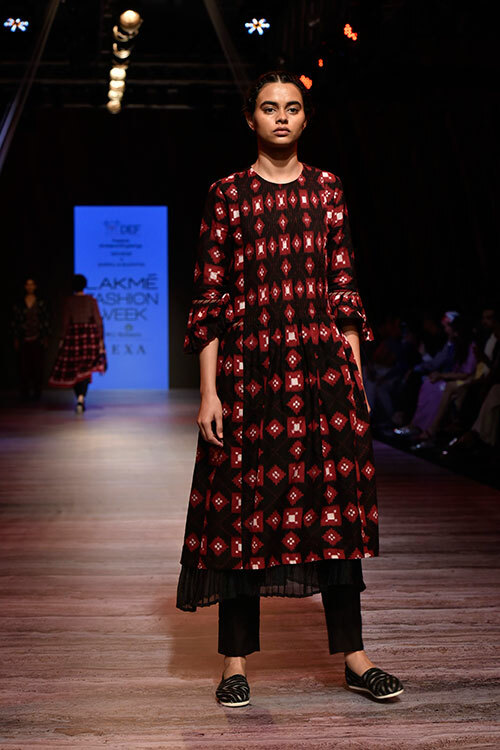 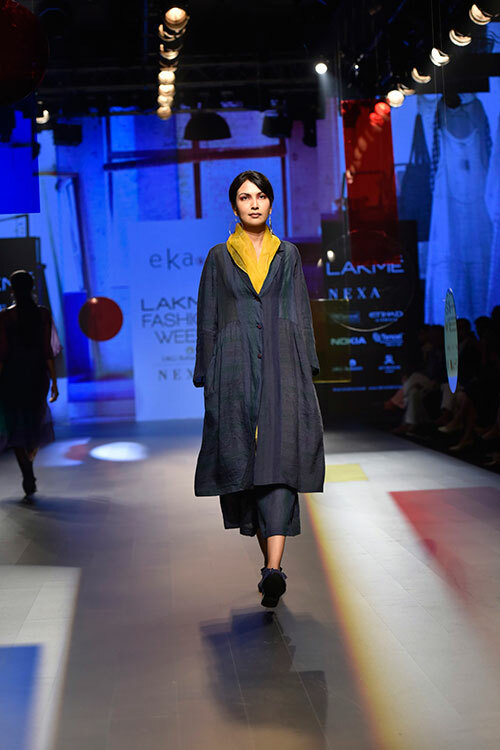 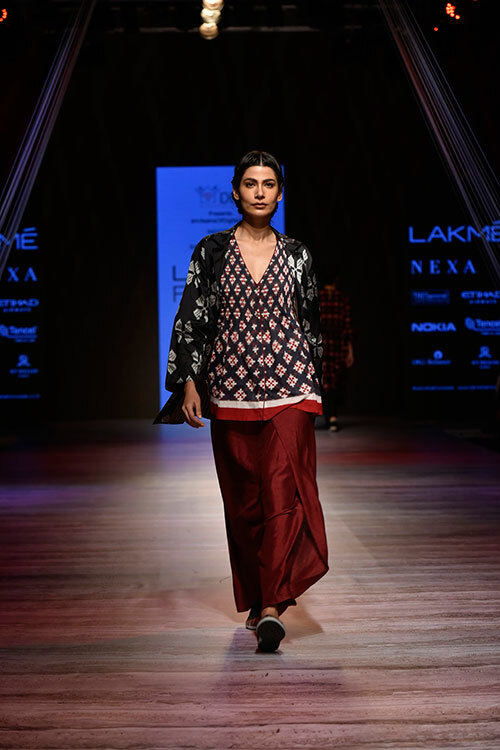 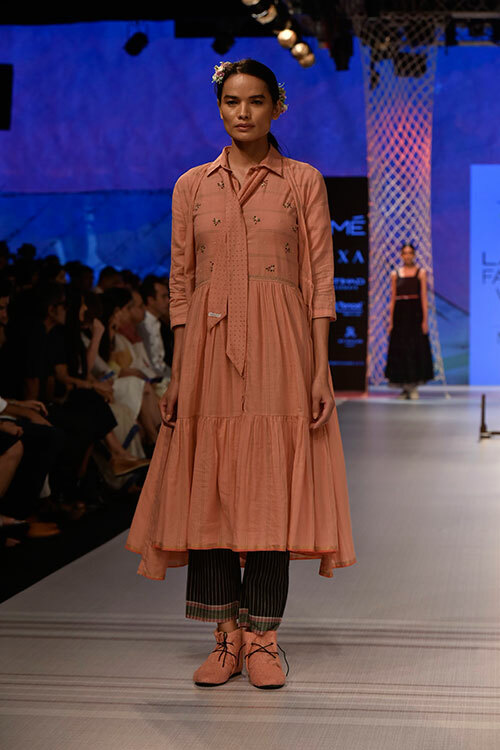 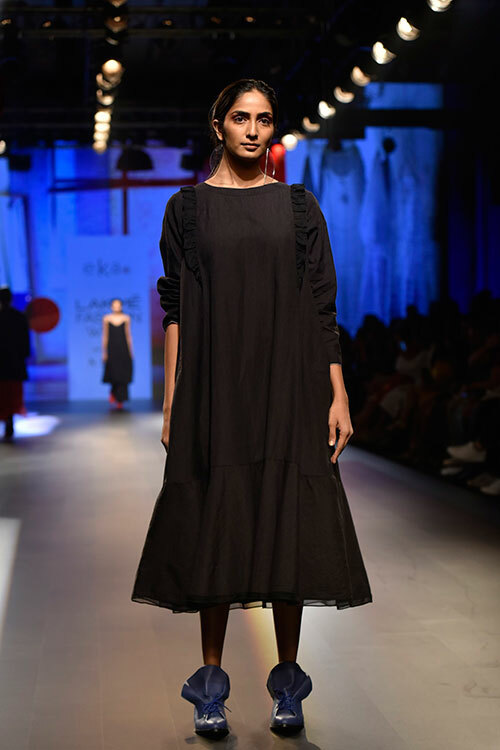 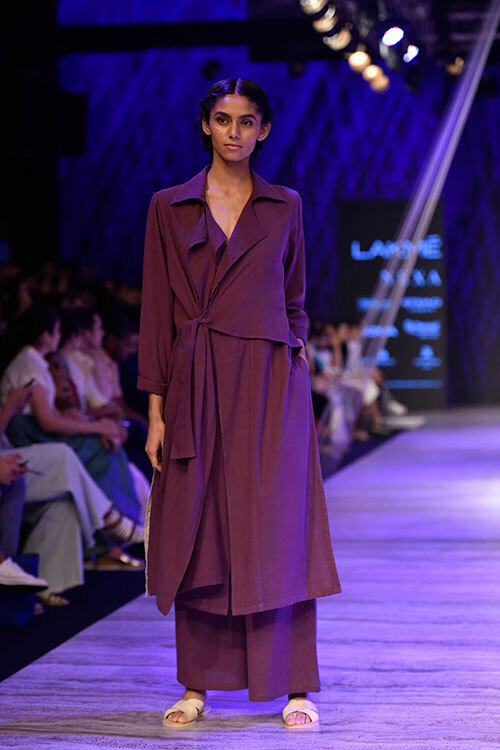 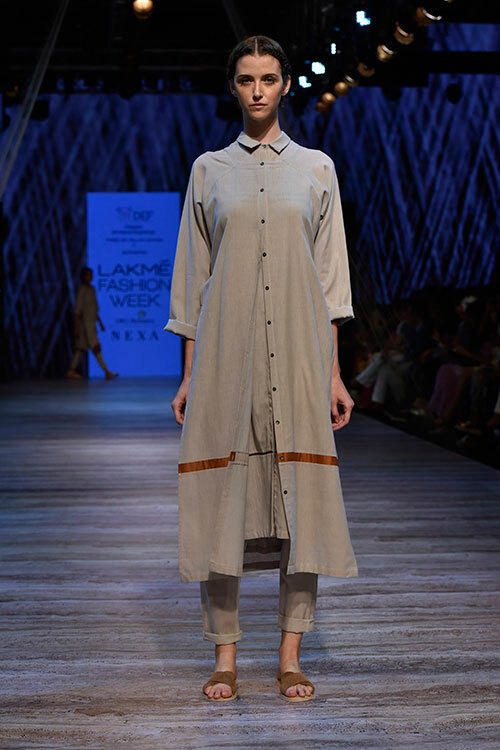 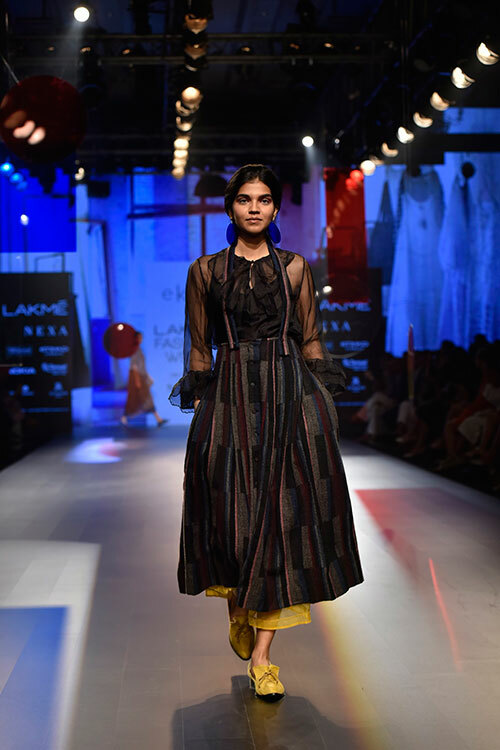 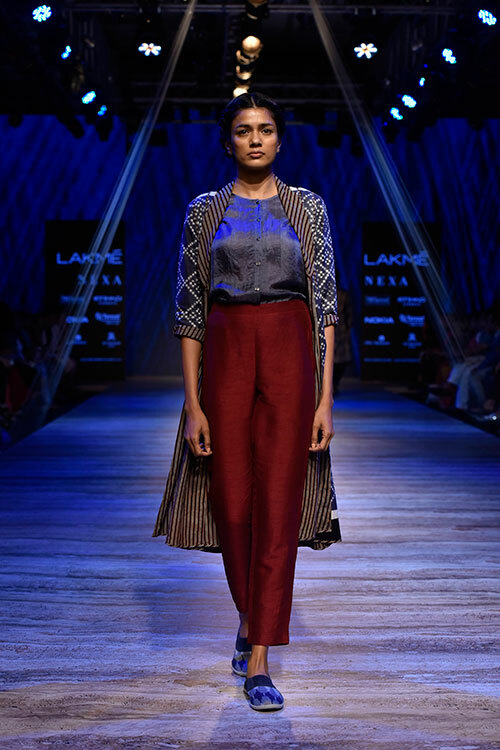 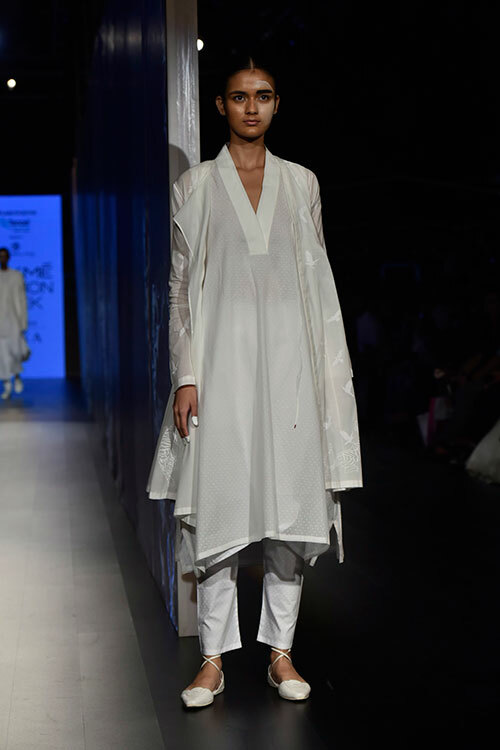 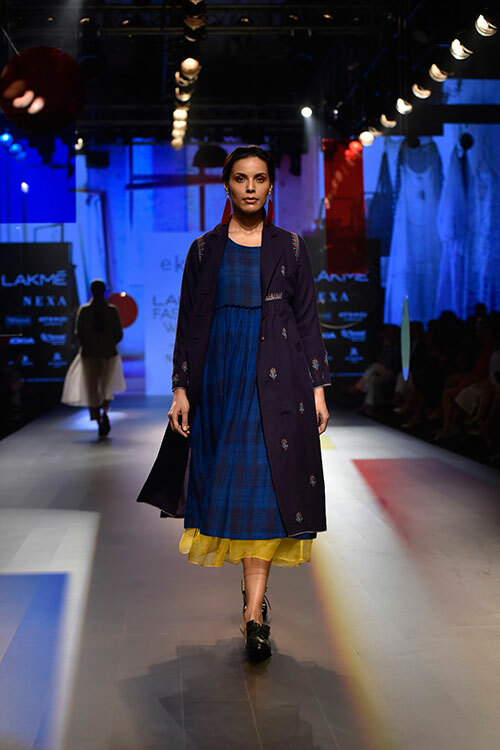 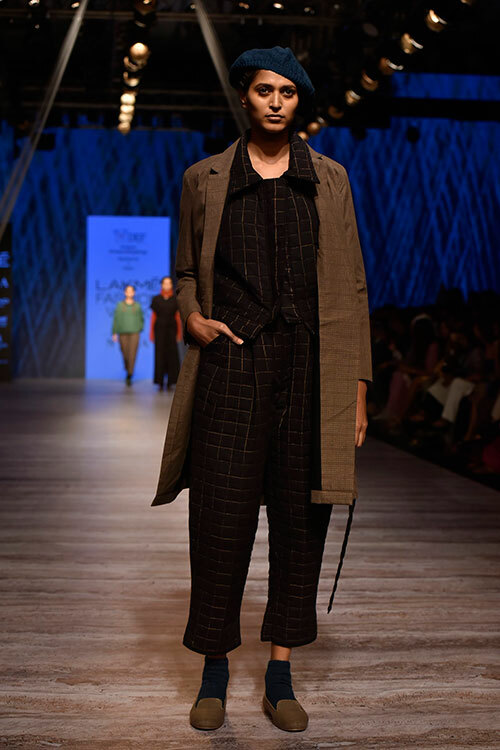 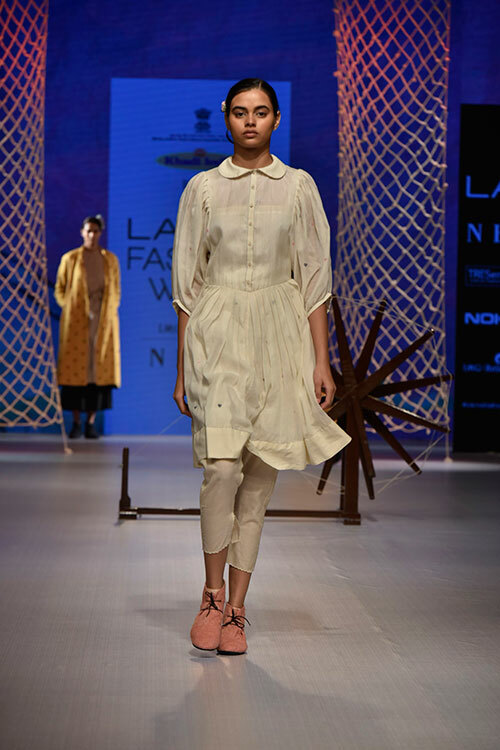 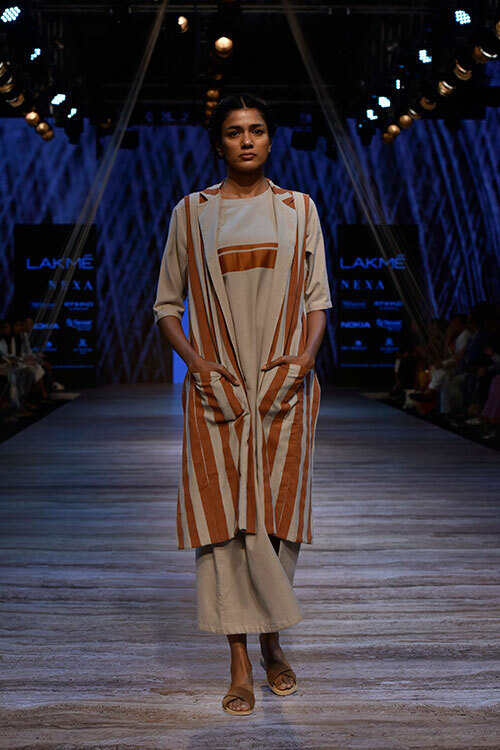 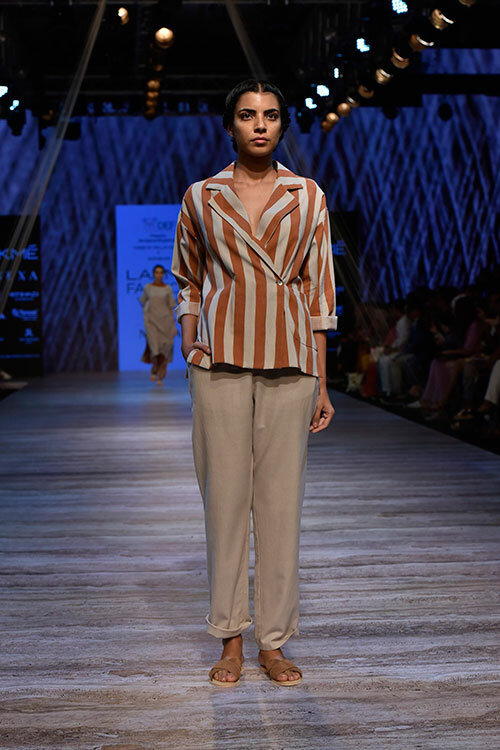 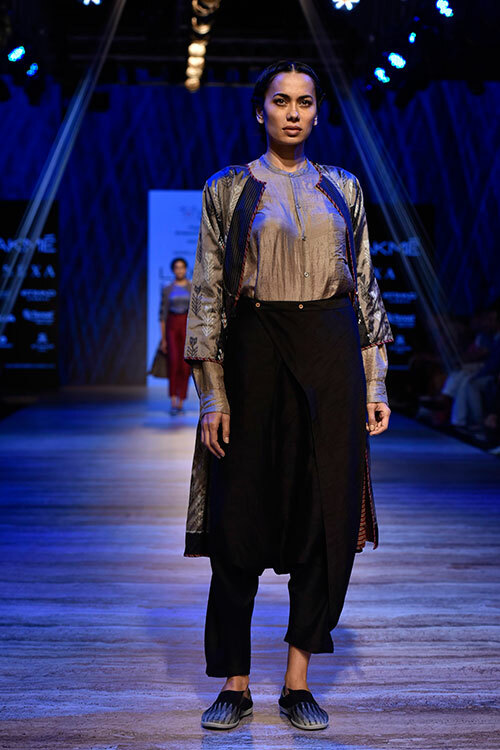 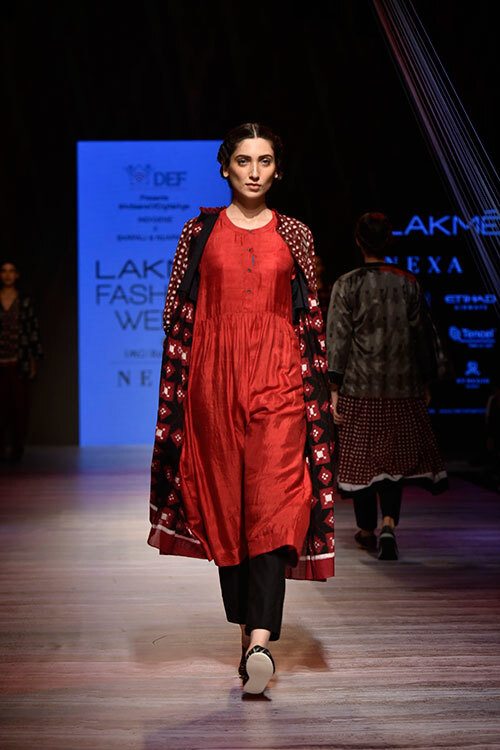 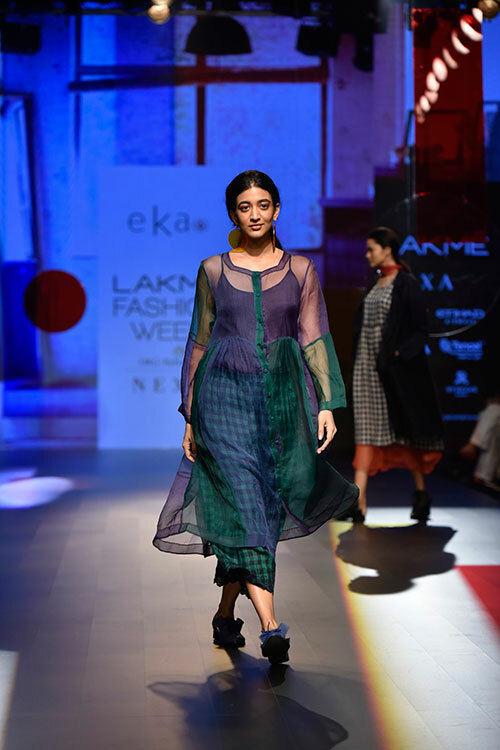 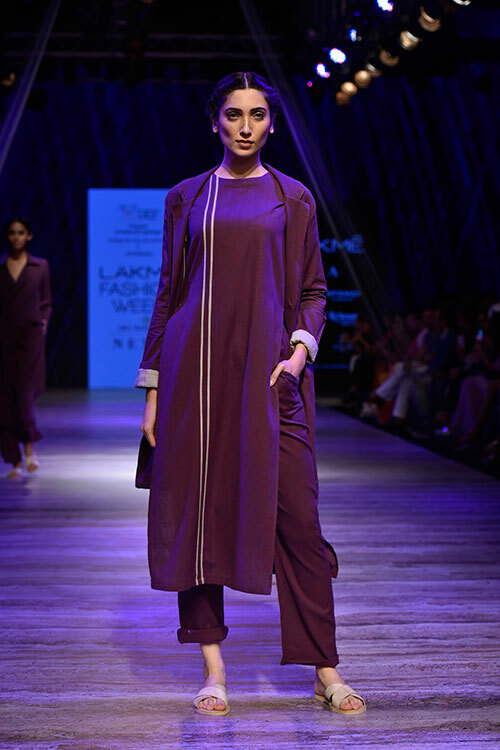 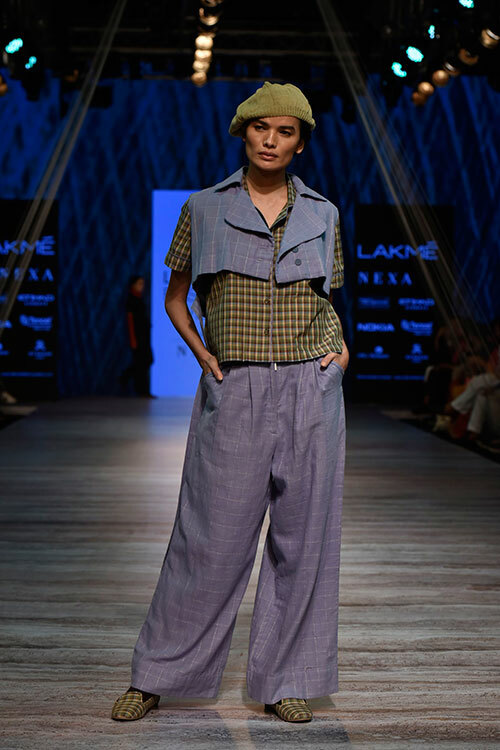 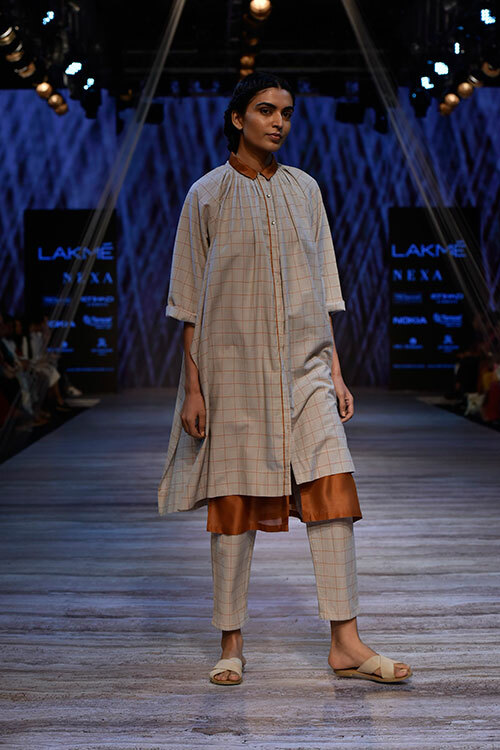 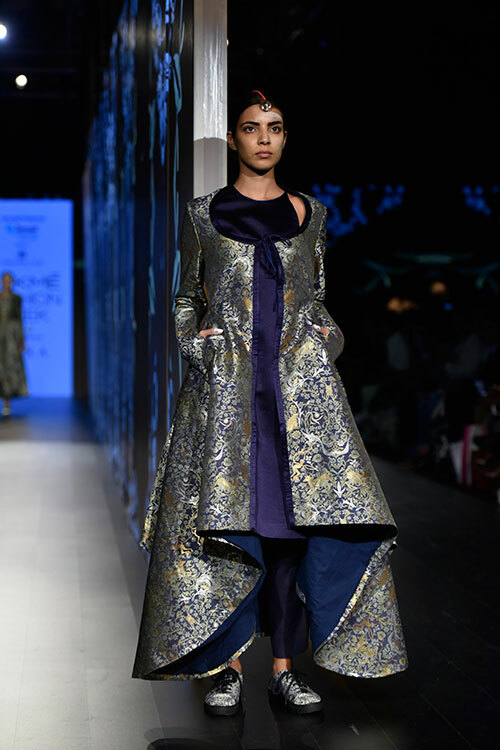 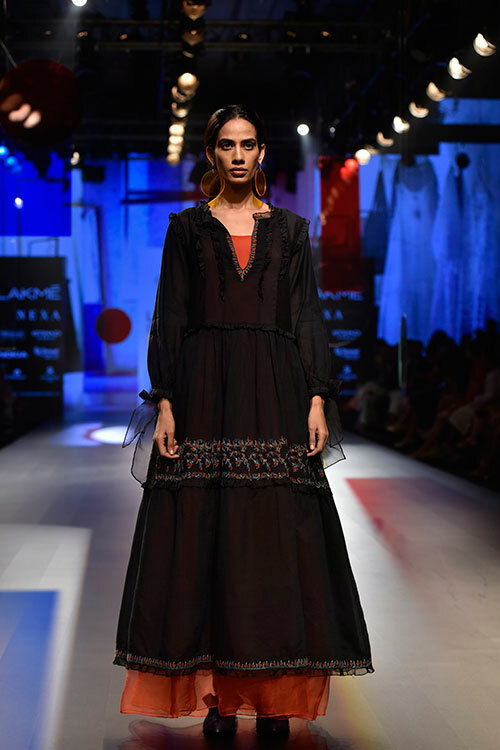 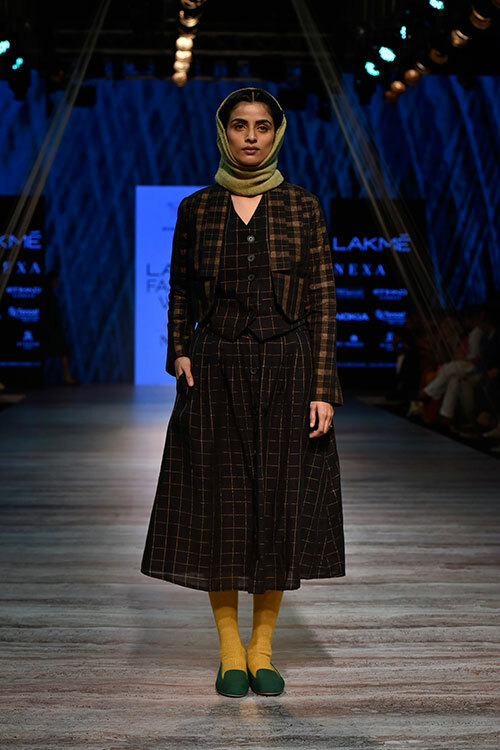 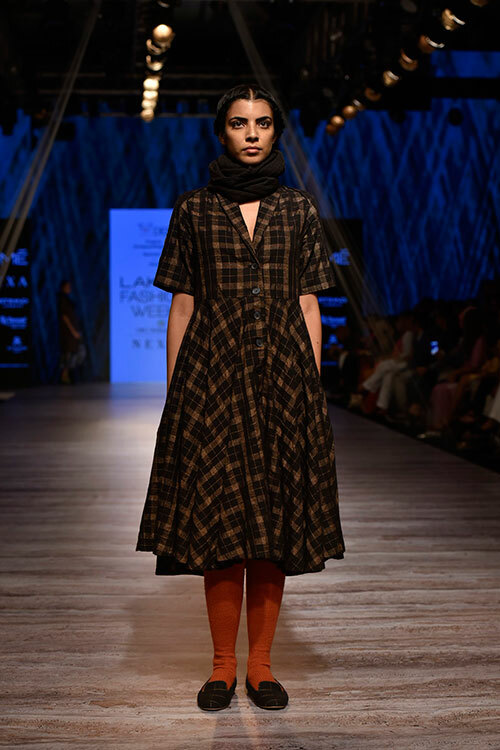 Transforming traditional weaves into western silhouettes, Naushad Ali presented a collection replete with cropped wide pants, checked tops, double-breasted blouses, kimono-style coats, shift dresses and trench coats. 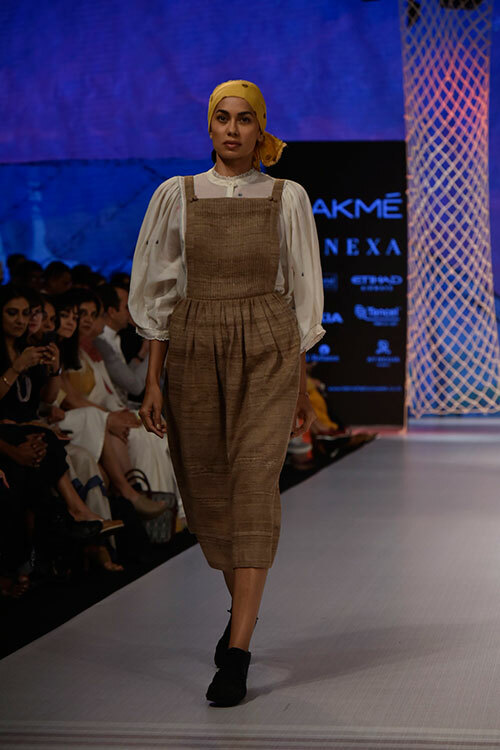 The colour palette was supposed to be inspired by nature, so the lush green of trees and the earthy tones of muddy fields appeared throughout the showcase. 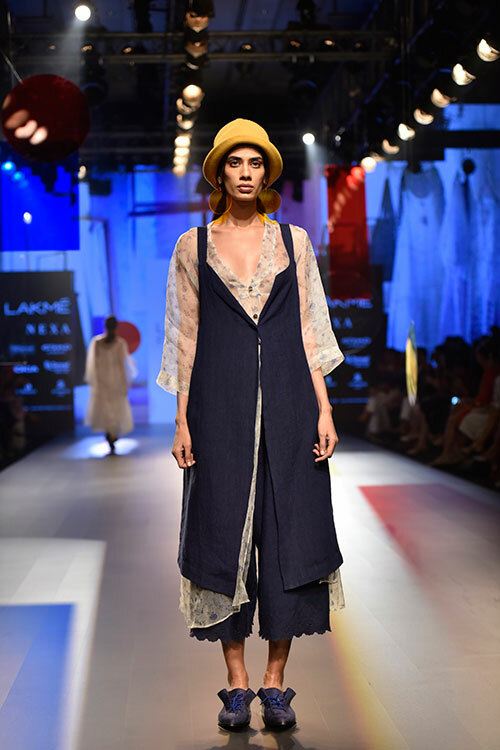 The granny chic vibe of the whole affair left its mark on us, especially the socks-sandal combination and the excess layers. 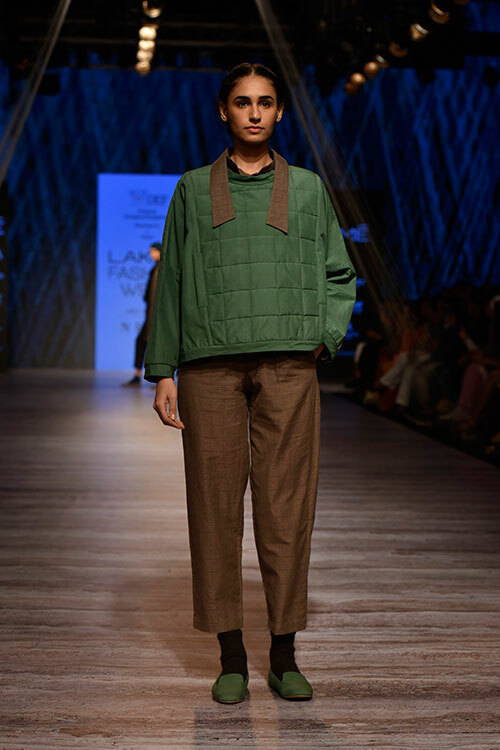 Comfort wear in 100 percent hand loom cotton — we couldn’t have asked for a better combination of design characteristics for Mumbai’s pseudo-winters if we wanted to. 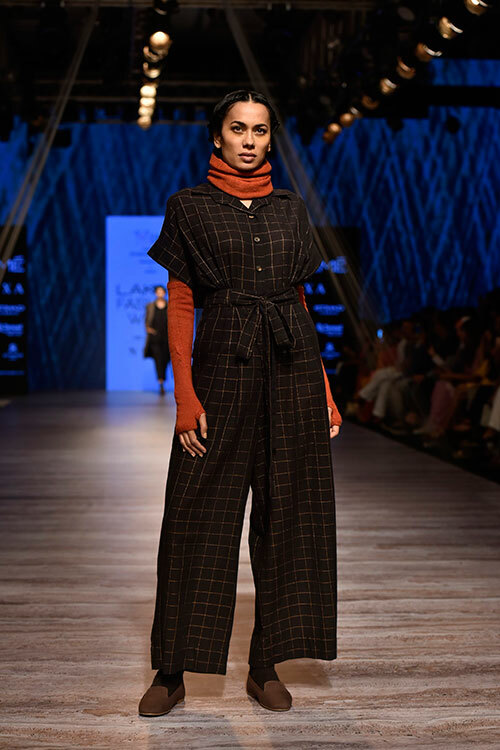 Pallavi Dhyani’s rustic, earthy textiles appeared in shades of grey, deep purple and burnt orange — all ideal colours for the cooler climates we are moving towards. 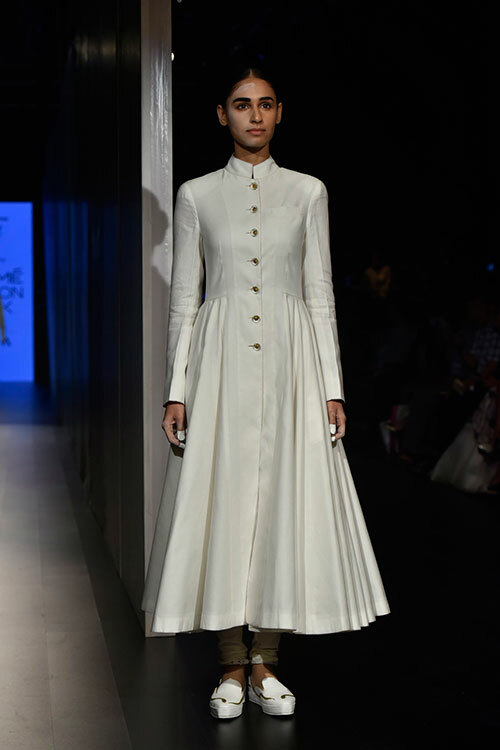 While the designer kept the silhouettes simple and basic, she made up for it with fine appliqué work and quilting made by way of surface ornamentation. 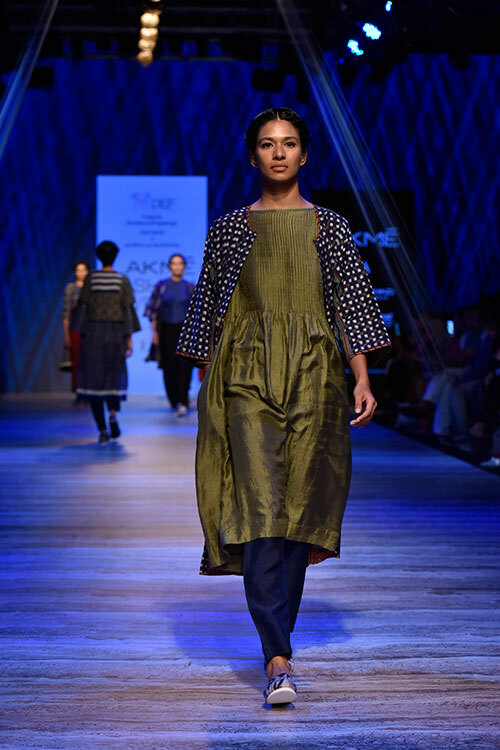 The show ended with the real heroes – the weavers and artisans taking to the ramp. 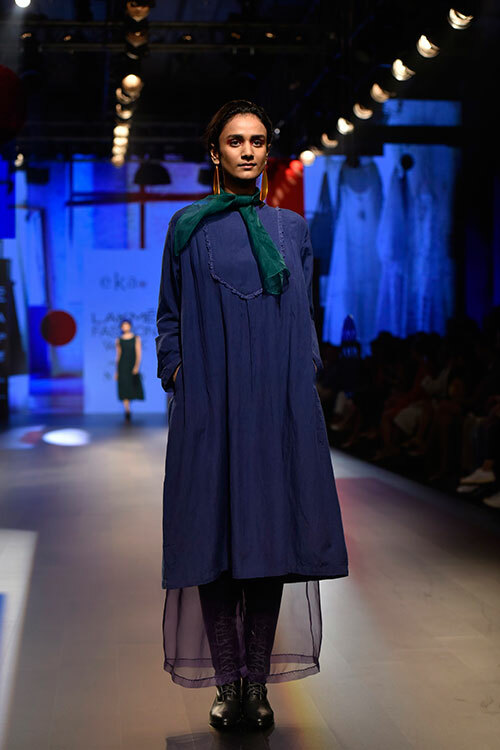 For the iconoclast who likes to dress up by dressing down, Rina Singh’s collection titled ‘Lived In’ had a nonchalant air about it. 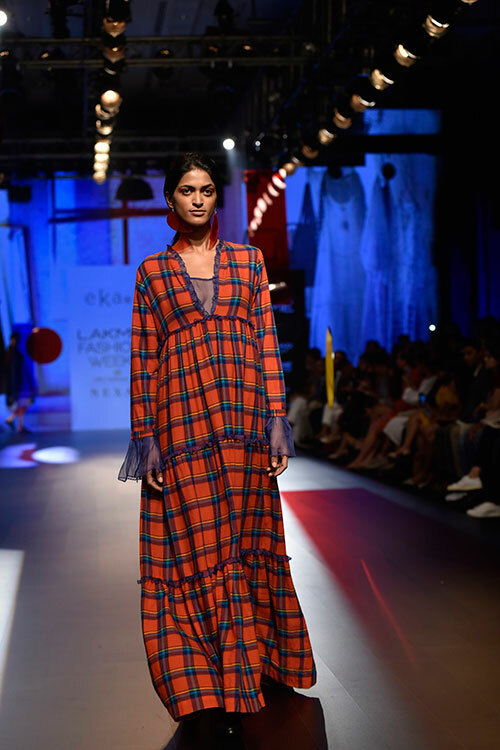 Pinafores, sheer midis, transparent robes and hemline dresses in cool, callous silhouettes made up the perfect capsule for a lazy winter wardrobe. 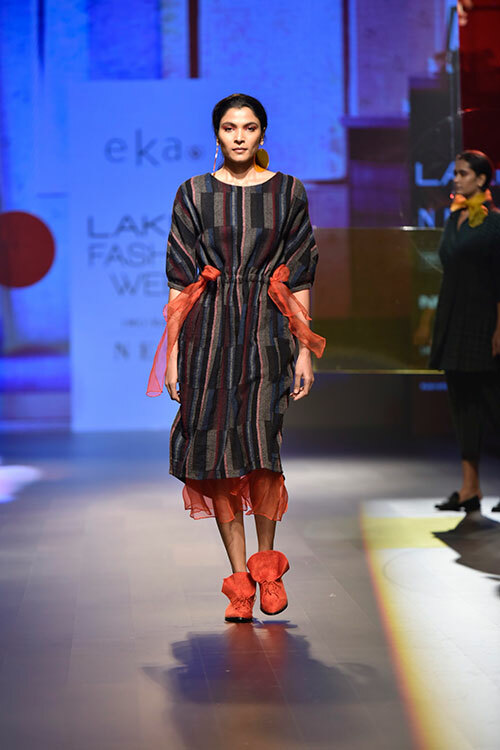 Eka’s special weaves were highlighted through a technique called ‘Kater Makur Kaj’ from rural Bengal which translates into ‘Cut Shuttle’ in English and was created by expert weavers in Shantipur, West Bengal. 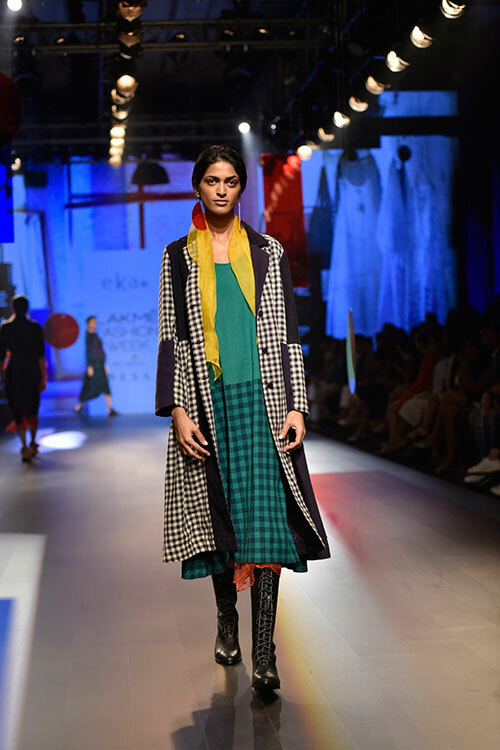 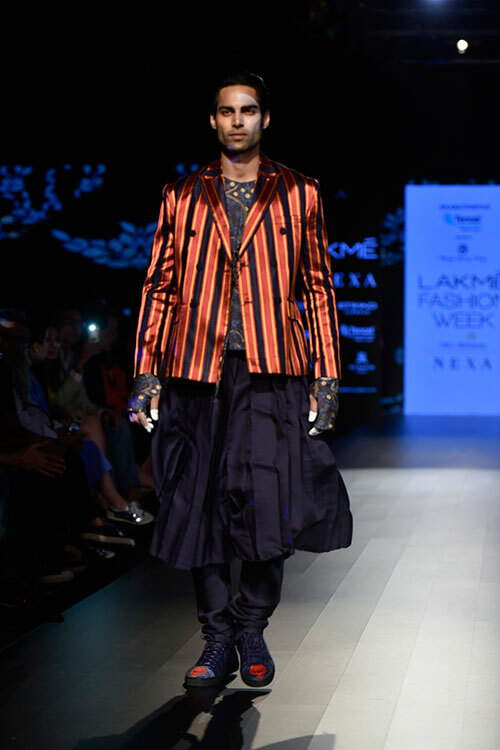 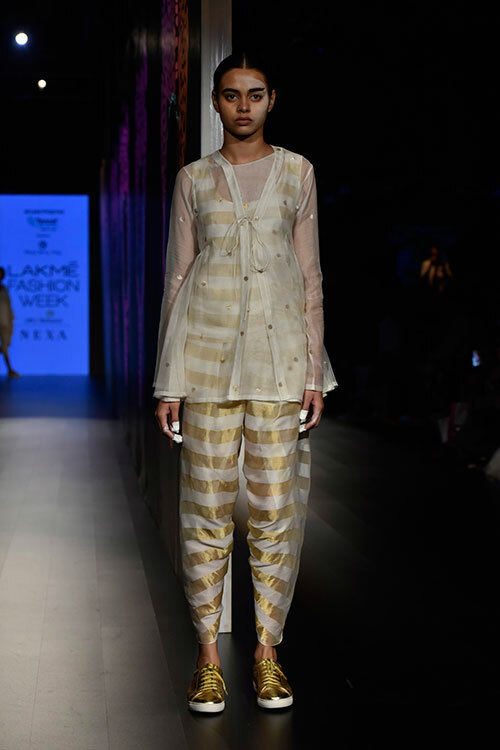 Sheer fabrics were part of almost every ensemble as they were layered over solid checked outfits or colour-blocked innerwear. 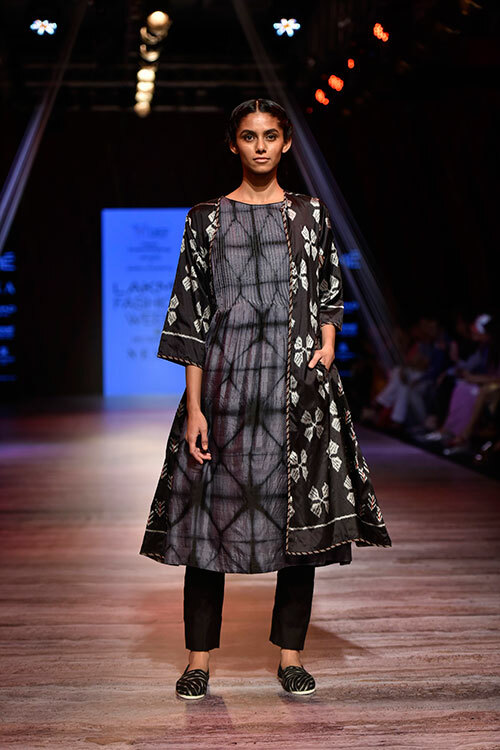 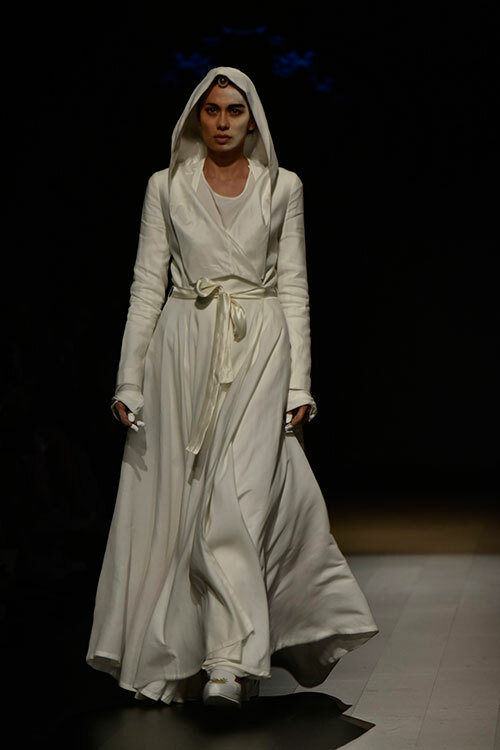 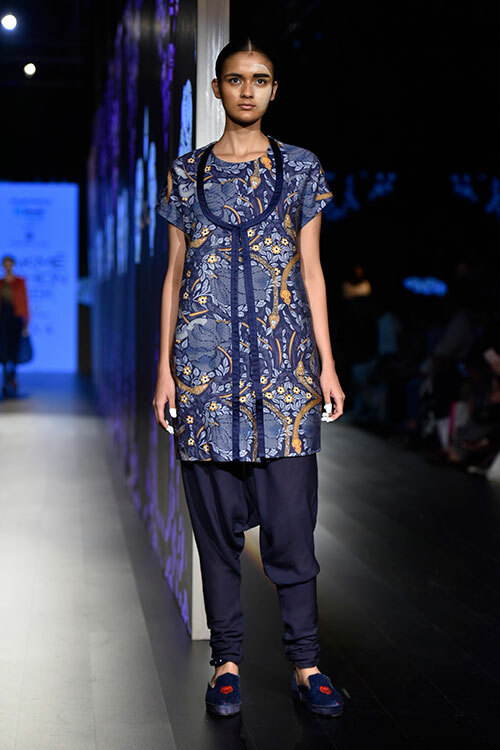 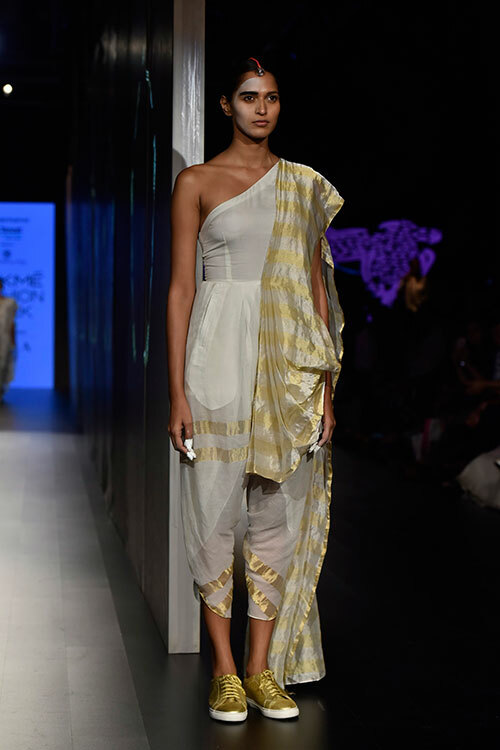 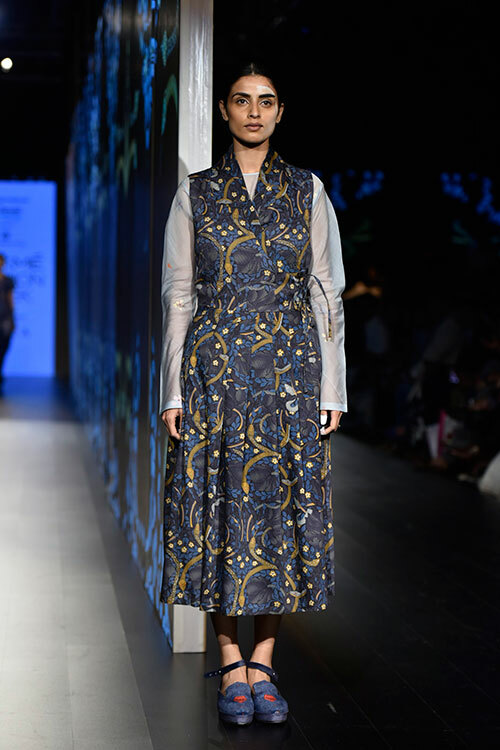 The designer’s second collaboration with Tencel was christened ‘Welcome to the Jungle’ and presented modern interpretations of ethnic-wear such as the Poshak and the Angarakha. 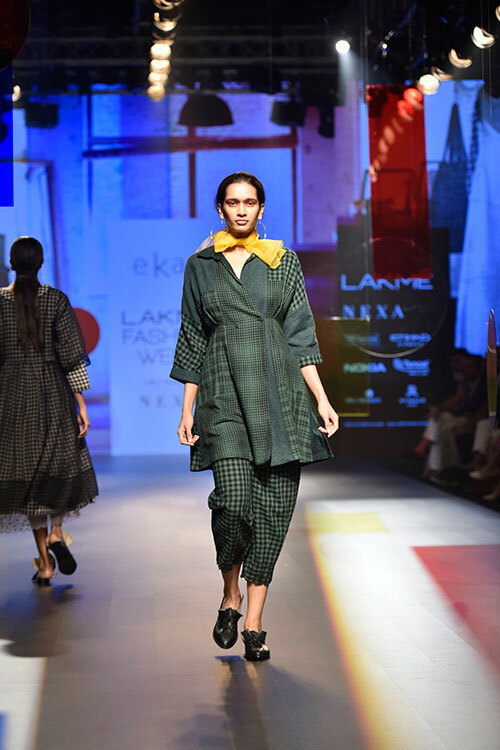 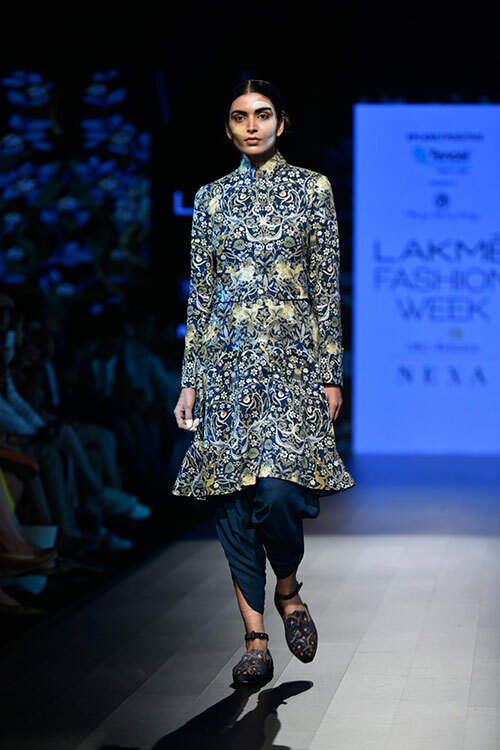 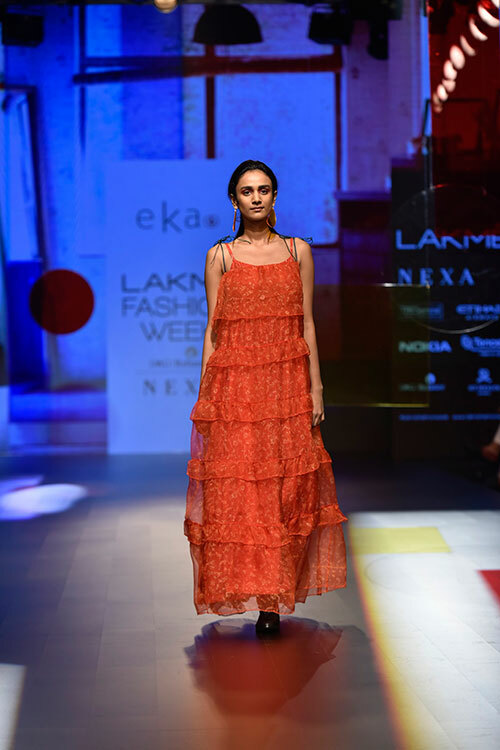 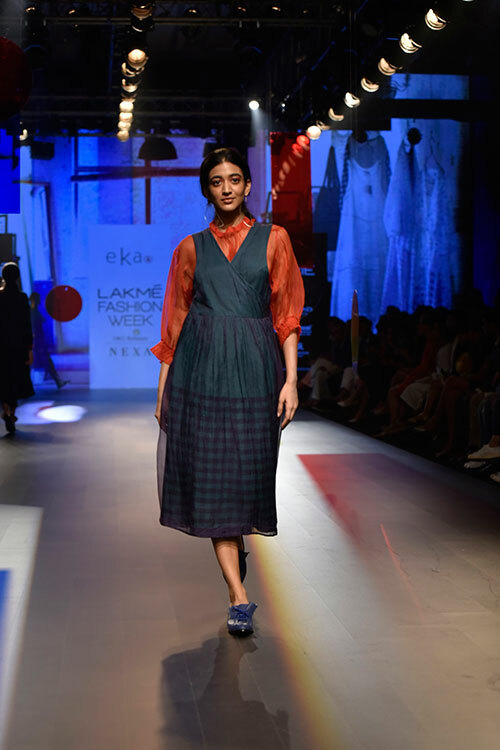 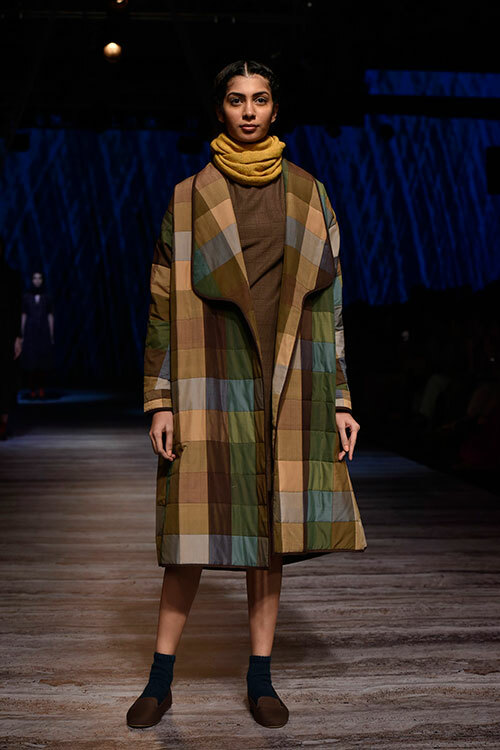 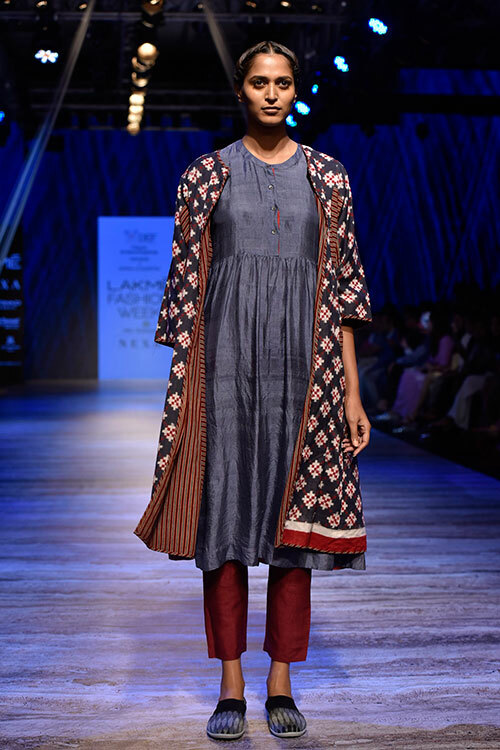 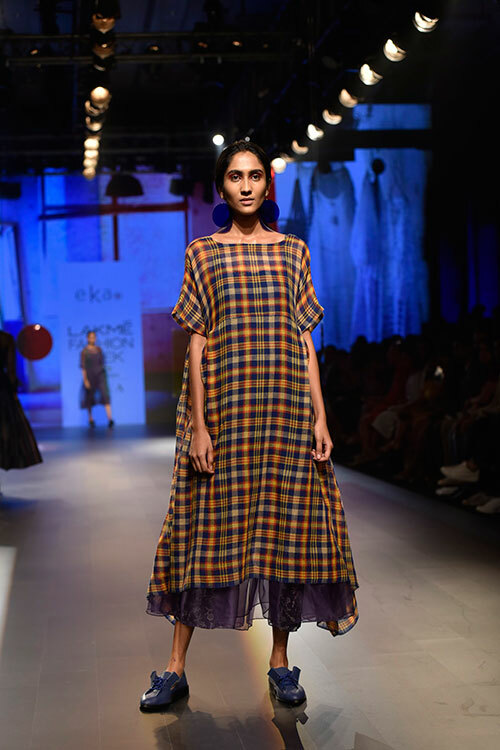 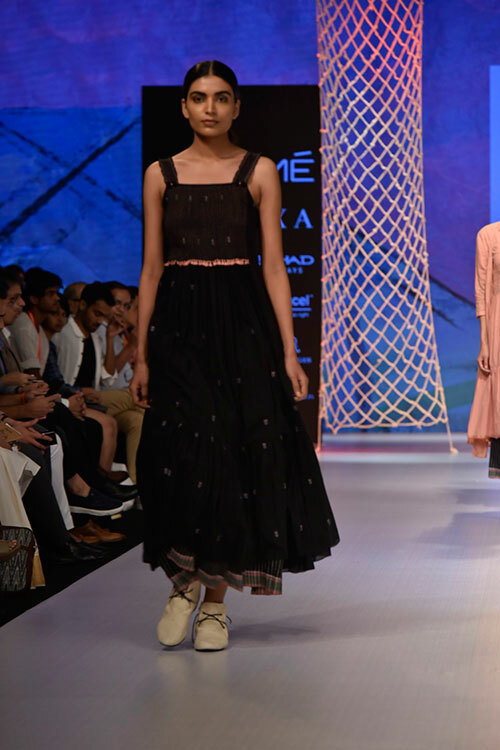 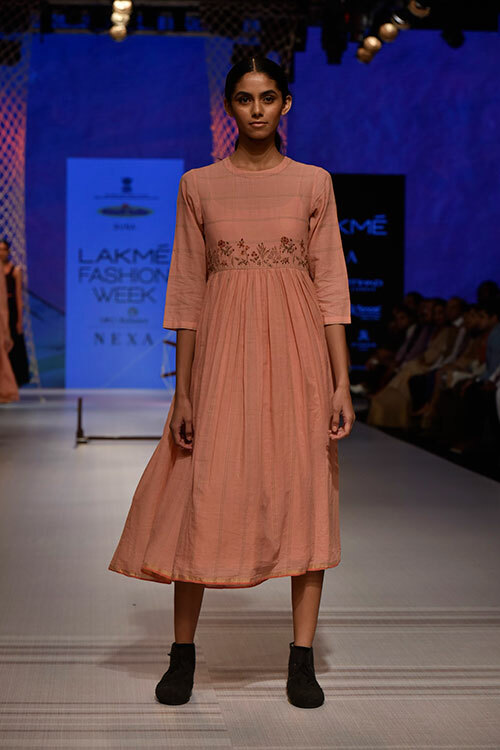 The garments employed the ecological fibre to weave handlooms such as Chanderi, Benarasi brocade, Jamdaani and Ikat and saw the designer move away from his trademark western silhouettes towards a traditional capsule. 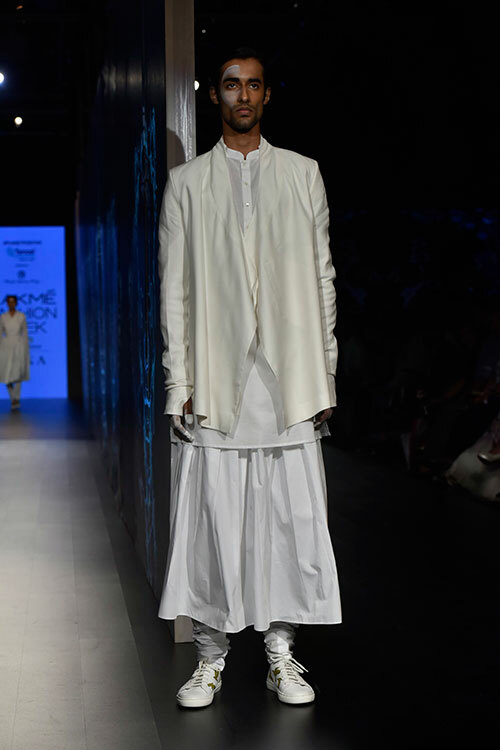 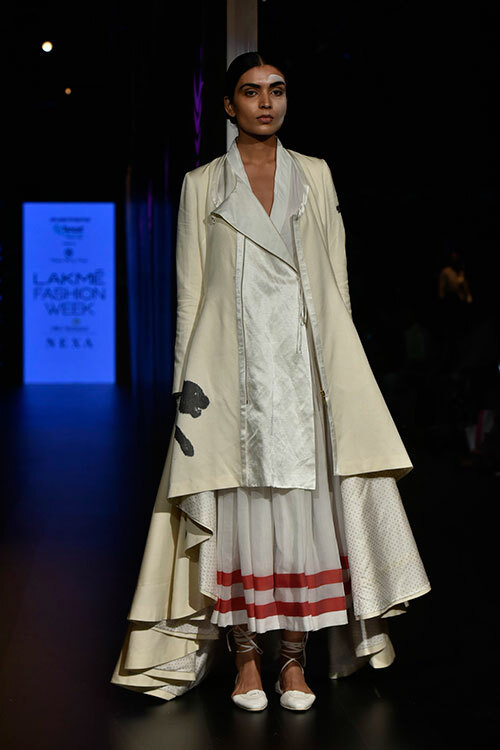 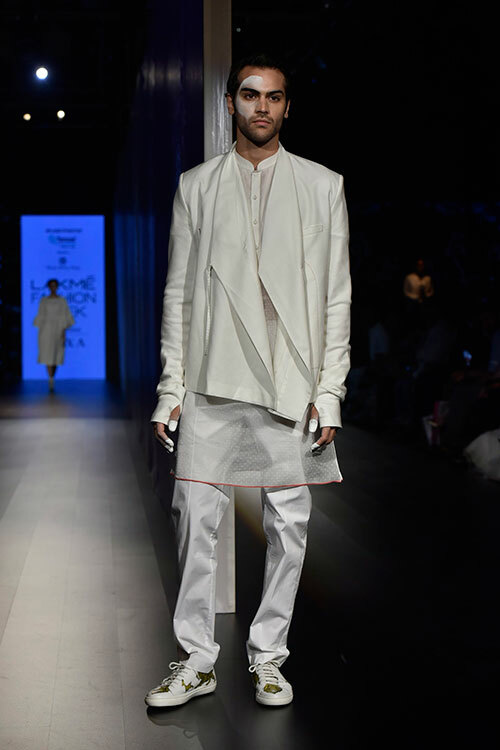 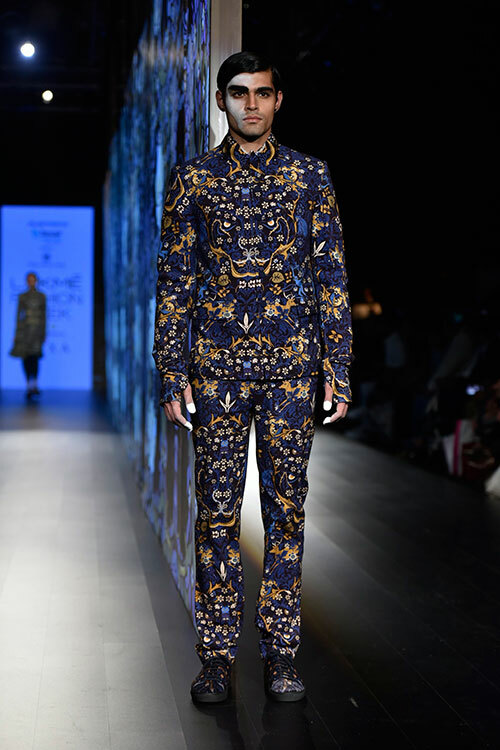 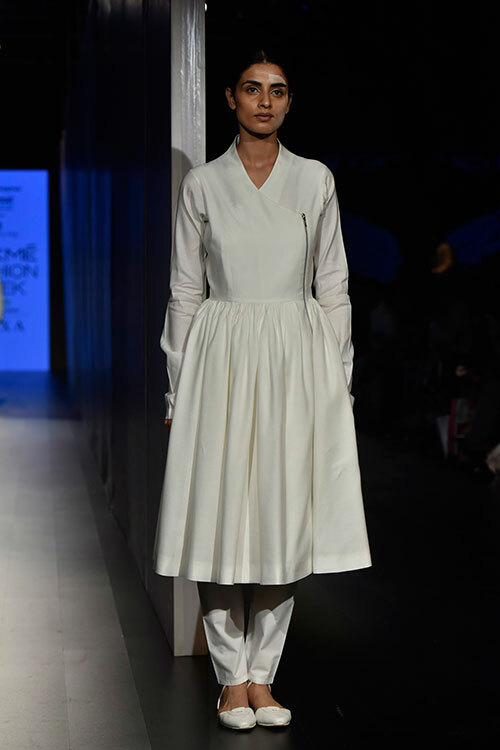 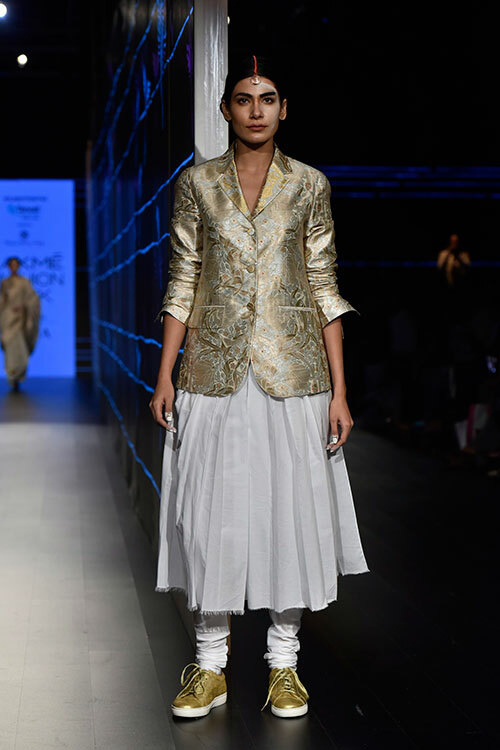 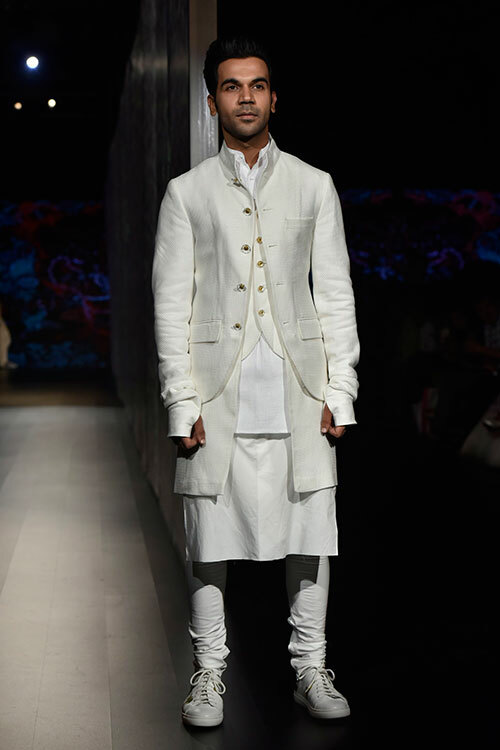 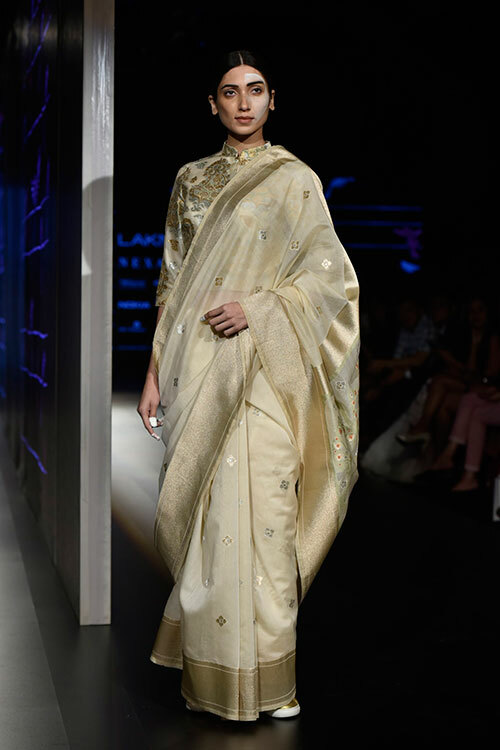 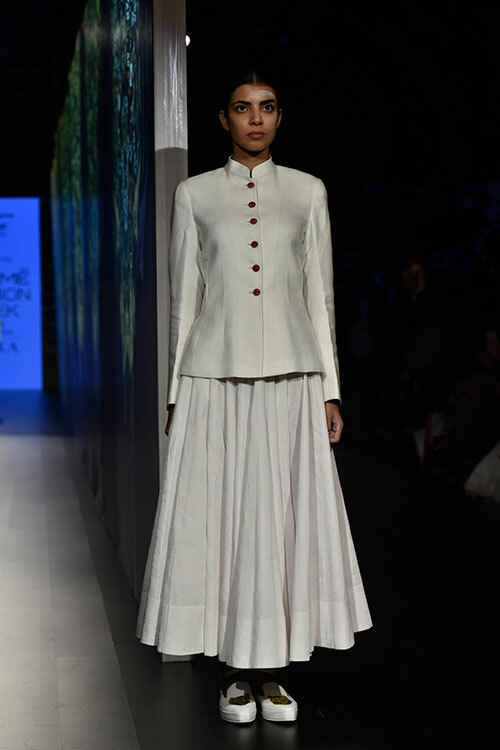 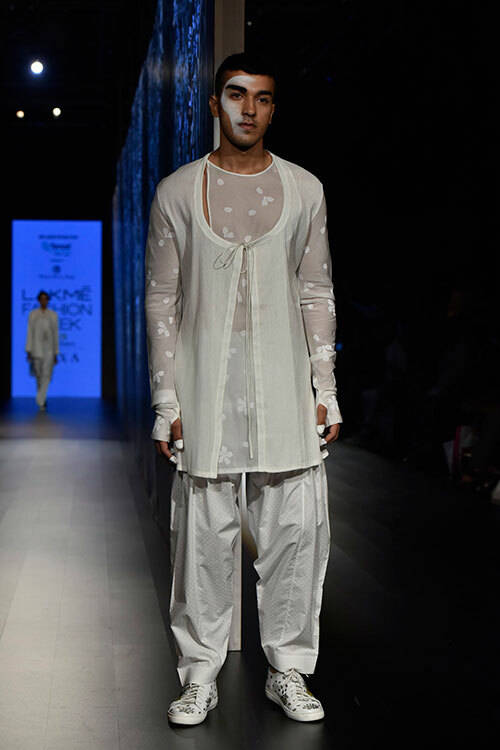 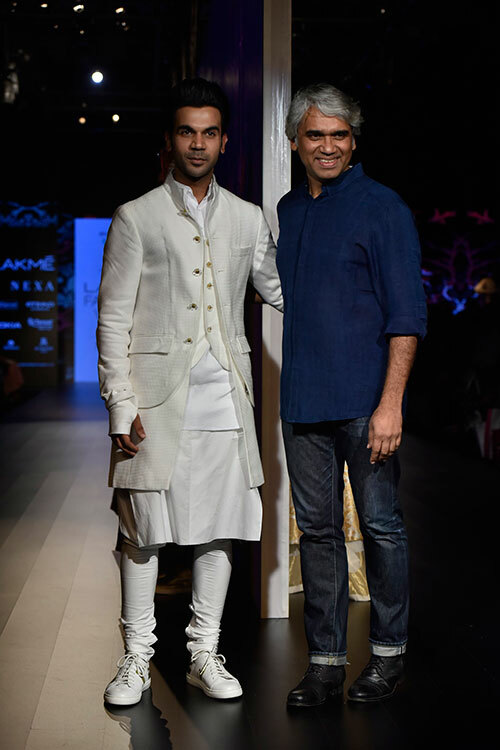 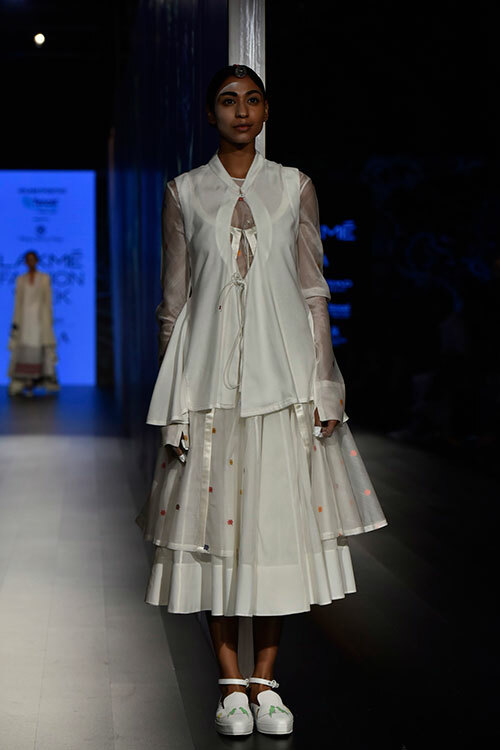 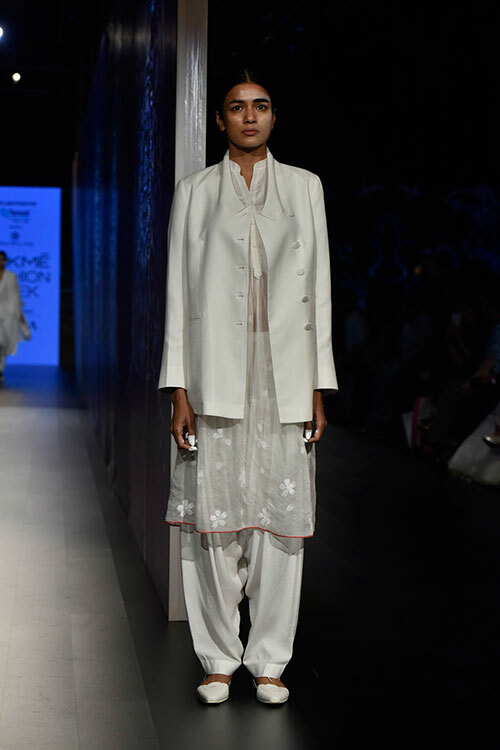 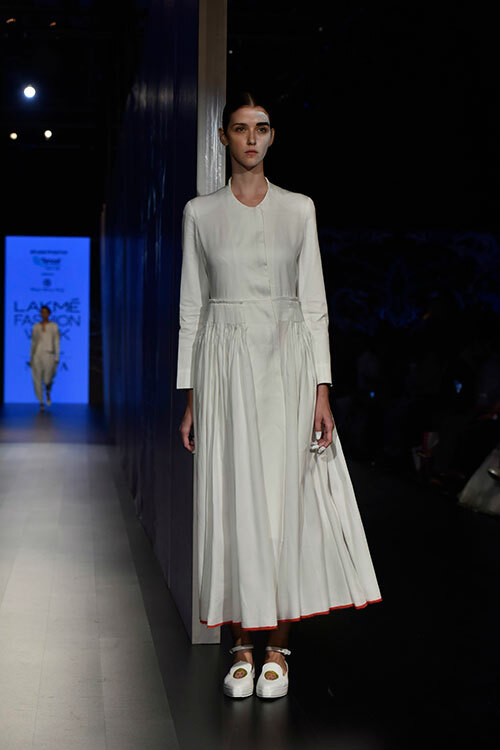 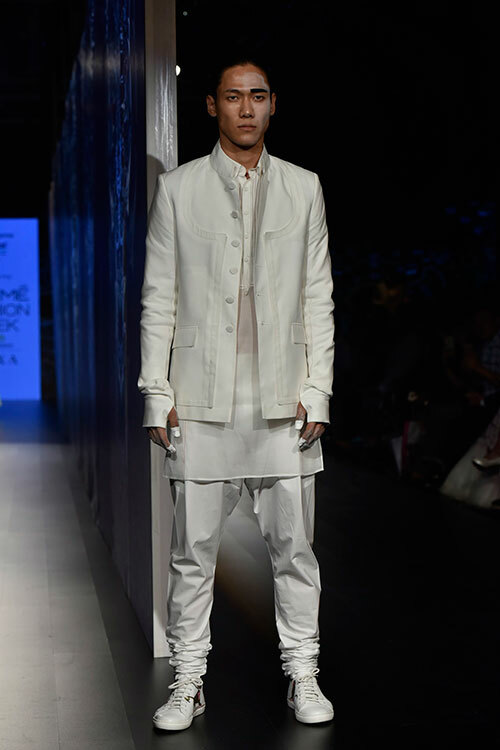 Whites dominated the collection as was evident from showstopper Rajkummar Rao’s pristine attire although Rajesh Pratap Singh played with accents of gold, silver, pastel blues and pinks. 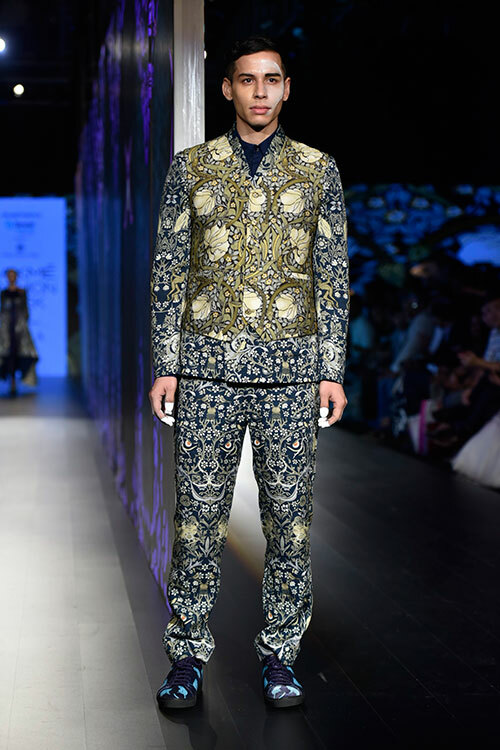 We now have our eyes on the handmade shoes with animal motifs that were created specially for this collection — you can make your pick from painted monkeys, tiger and panthers.